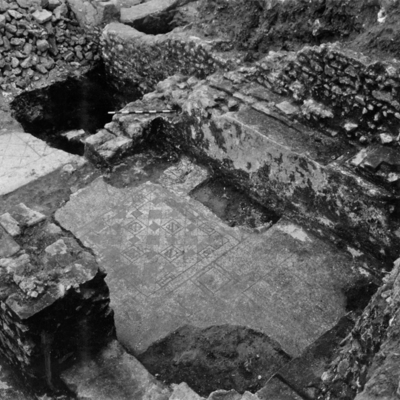 General view of Room 1 showing mosaic floor. 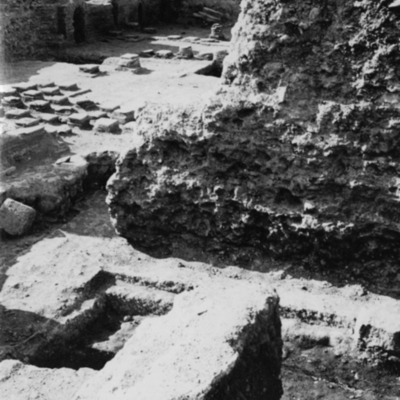 View of graves in Rooms 1 & 2. 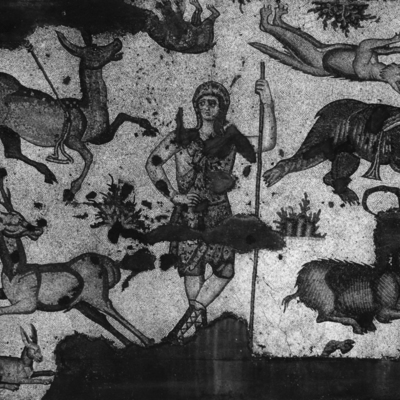 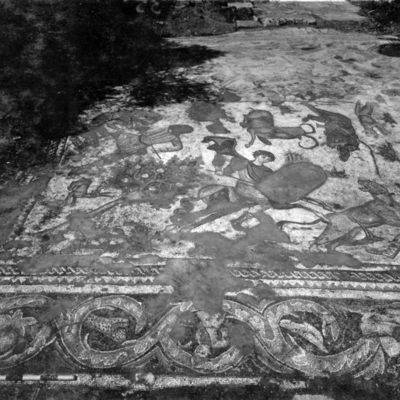 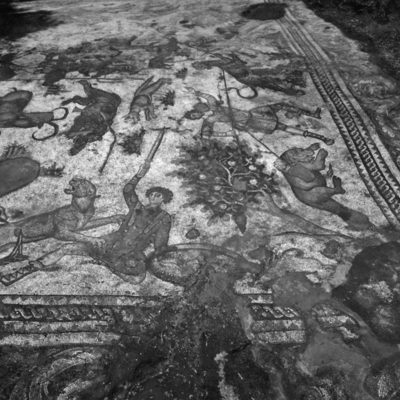 Mosaic floor with head of Ktisis and animals view before raising. 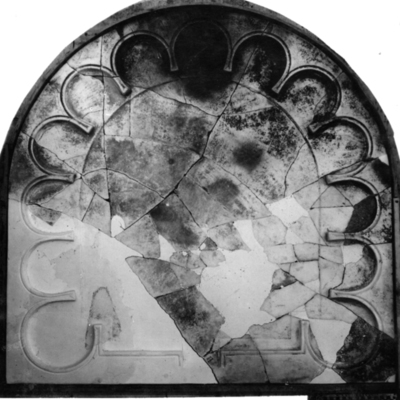 Geometric panel on north side of Room 1 not raised. 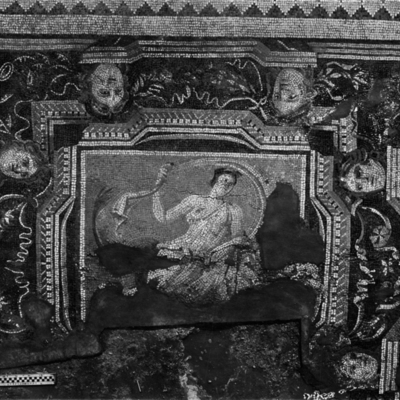 Corner panel from Room 1 showing the head of a goddess. 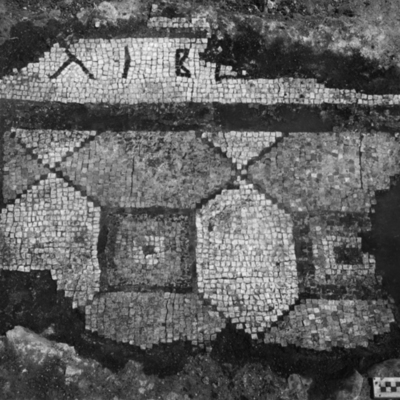 General view of mosaic floor in Room 1. 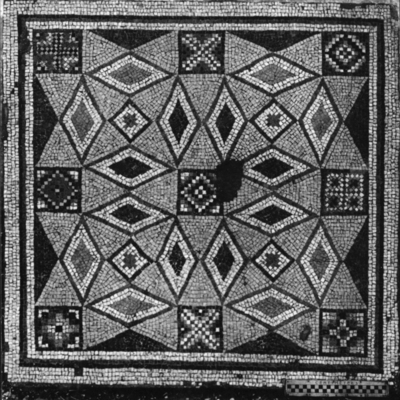 Detail of geometric pavement in Room 1. 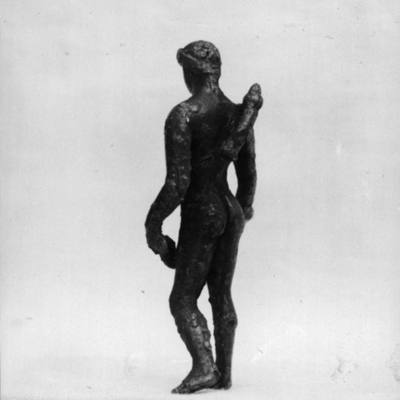 Bronze figure of Apollo rear view #3669-S133. 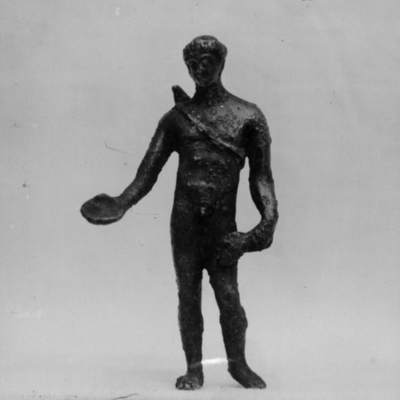 Bronze figure of Apollo front view #3669-S133. 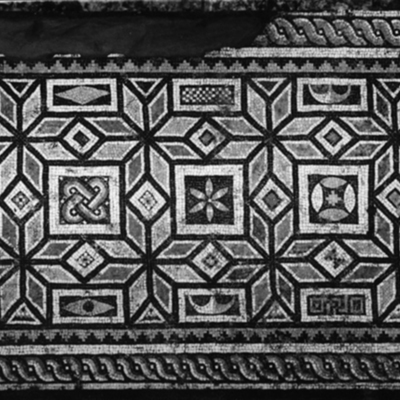 Small geometric panel raised from Room 1. 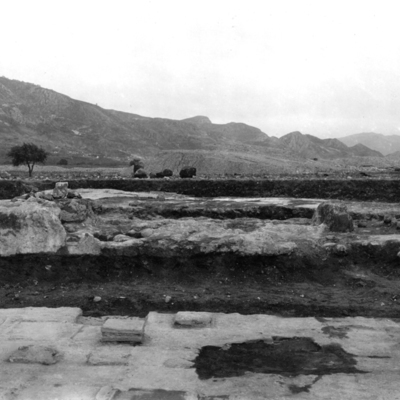 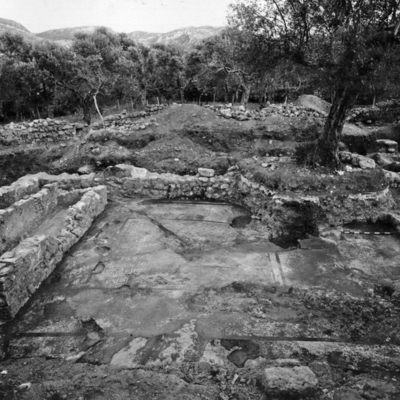 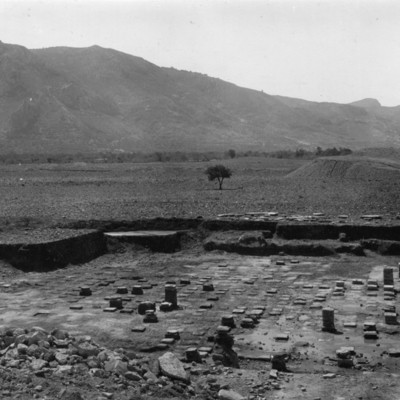 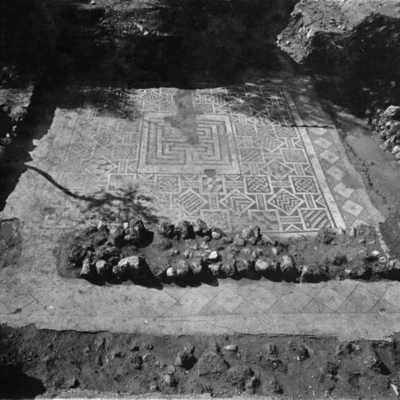 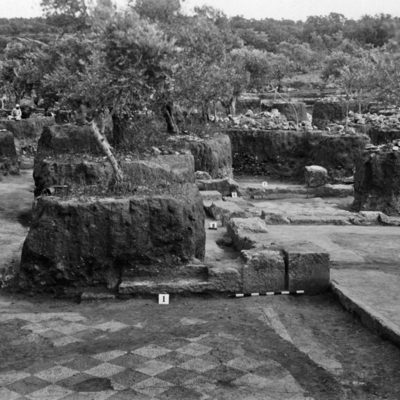 General view of mosaic floor after clearing. 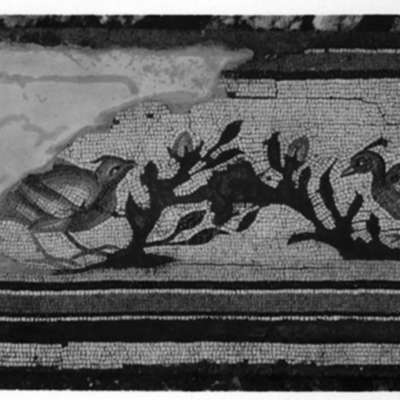 General view of the Phoenix mosaic. 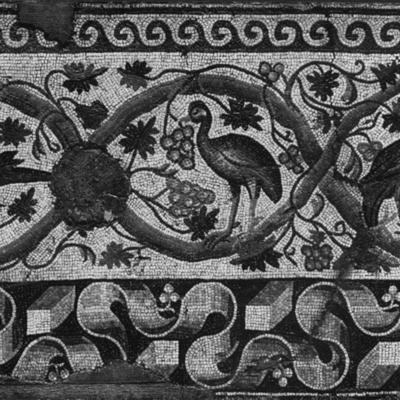 Detail of the Phoenix mosaic. 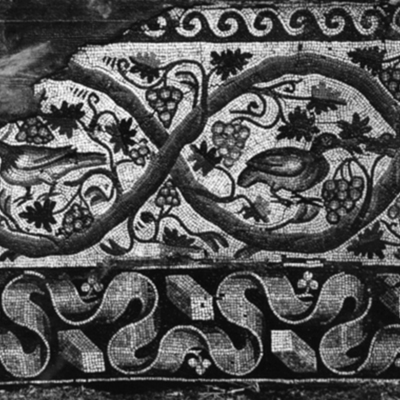 Detail of the ram's head border around the Phoenix mosaic. 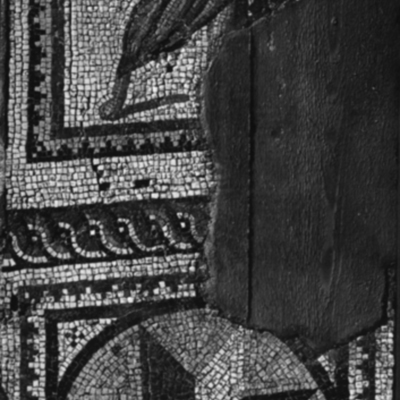 Detail of a corner of the ram's head border around the Phoenix mosaic. 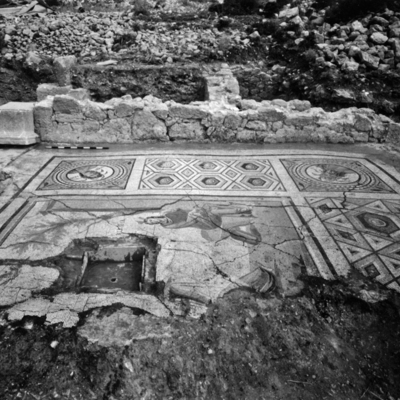 General view of mosaic floors in lower Rooms 1 & 2. 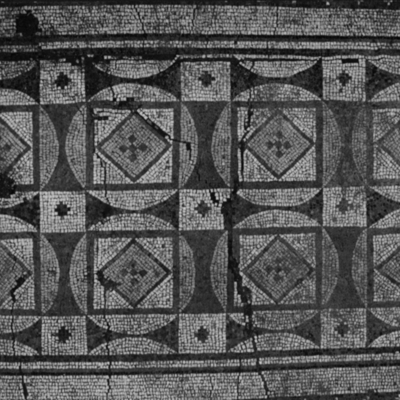 General view of mosaic floor in lower Room 1. 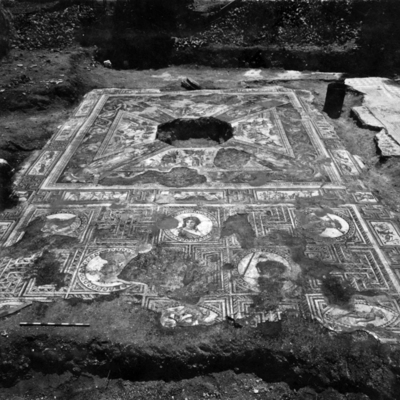 Excavation of Rooms 1 & 3 under Phoenix mosaic. 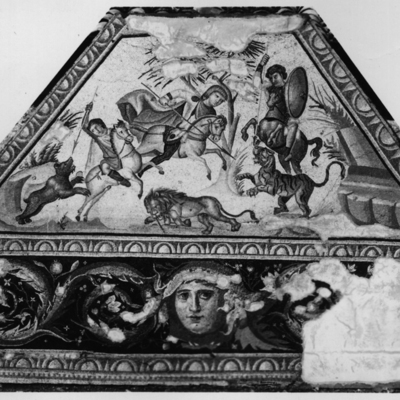 Terracotta altar with scene of Herakles wrestling the lion. 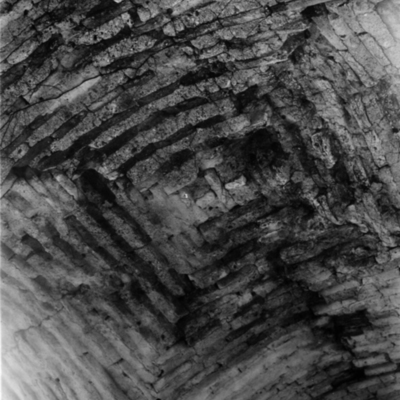 Detail of brick vault in Room 1. 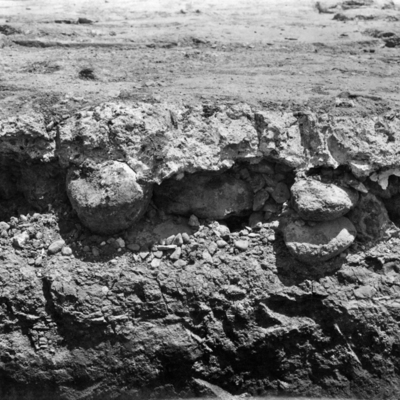 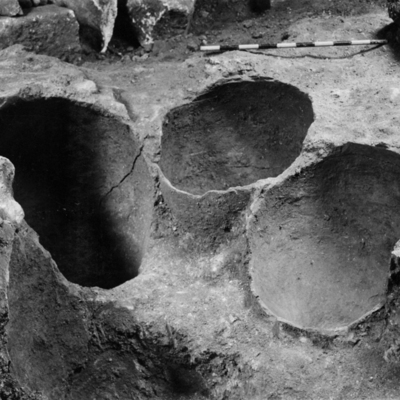 Large jars built into cement Room 1. 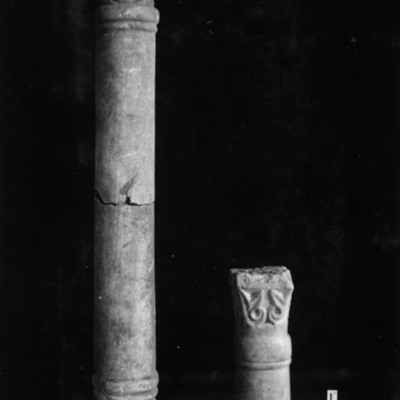 Metal objects from the Hellenistic level. 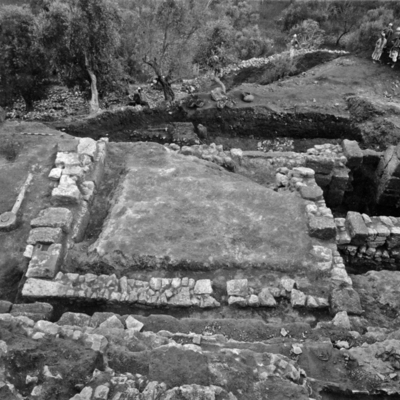 General view of Rooms 3 2 & 1. 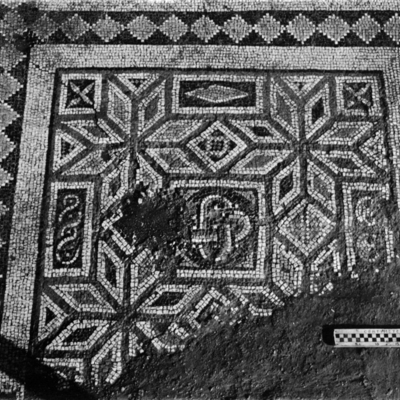 Calendar mosaic in Room 1 north end. 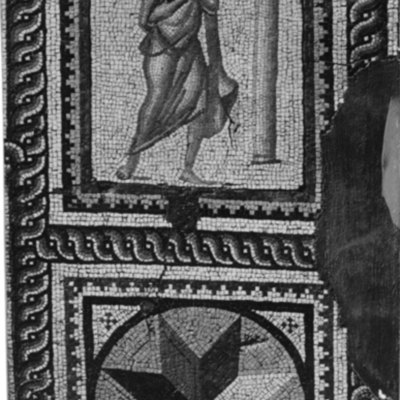 Detail of Calendar mosaic in north end of Room 1. 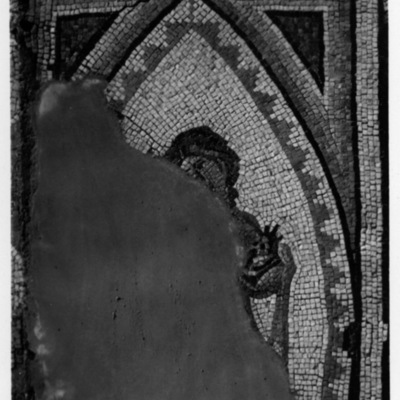 Detail of Calendar mosaic northwest corner of Room 1. 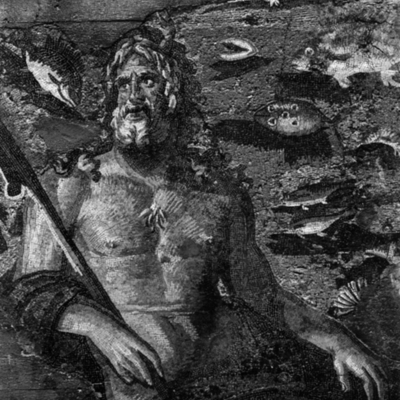 Detail of south end of Room 1: Oceanus and Thetis and Room 2: running fisherman. 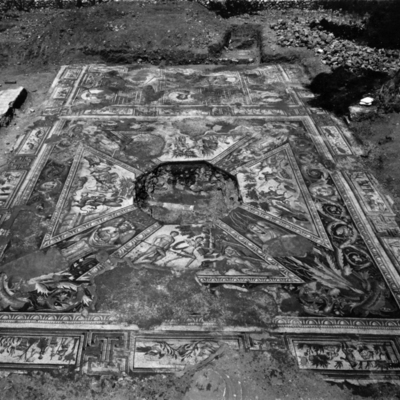 General view of triclinium mosaic floor in Room 1. 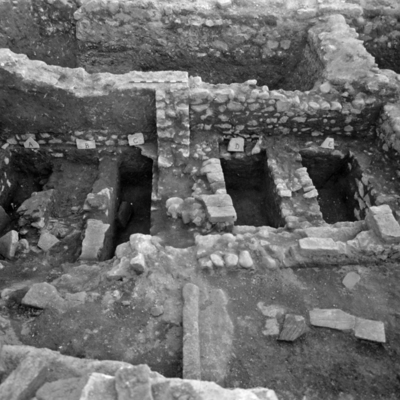 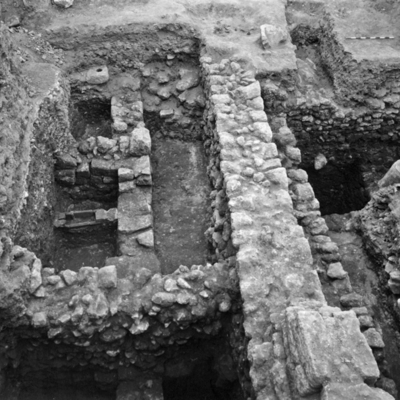 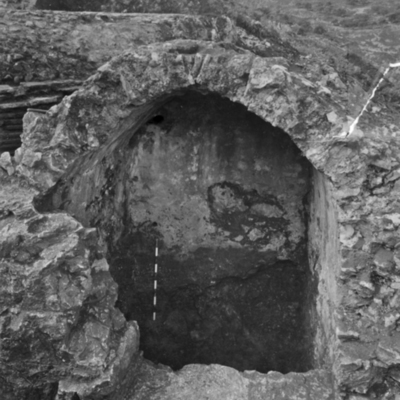 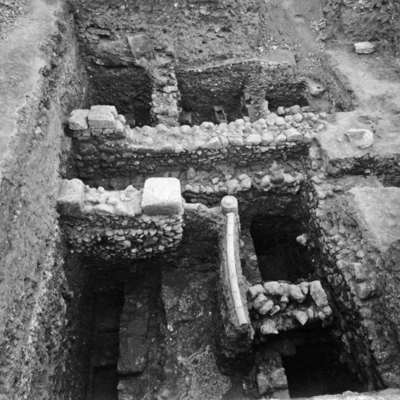 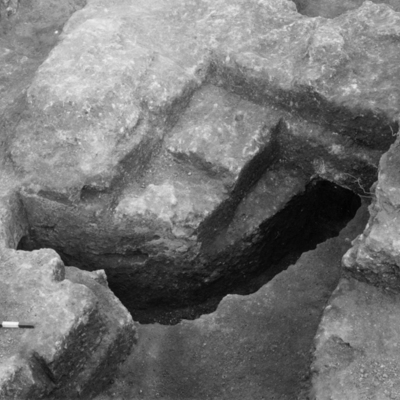 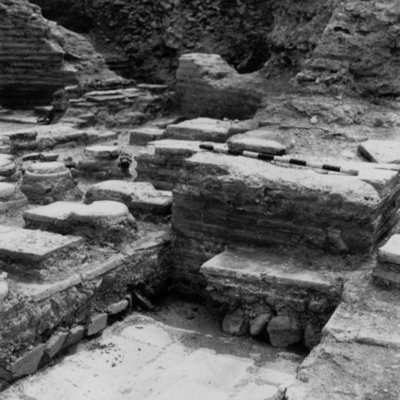 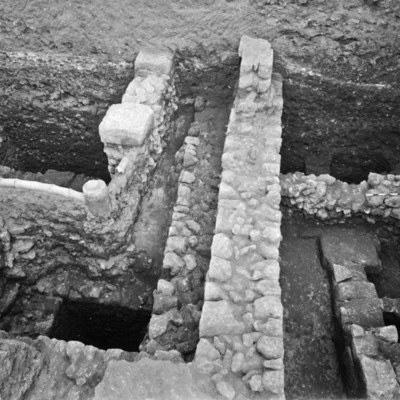 View of excavations below Rooms 1 & 2. 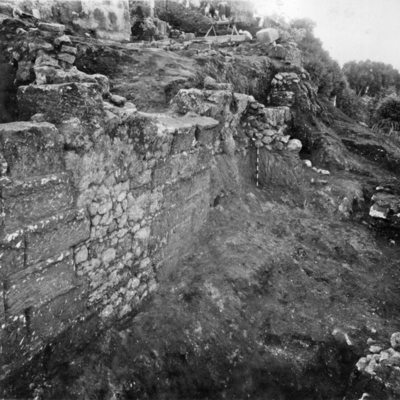 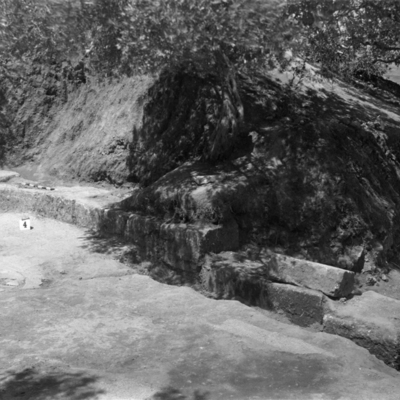 Terrace wall west of Rooms 1 & 2. 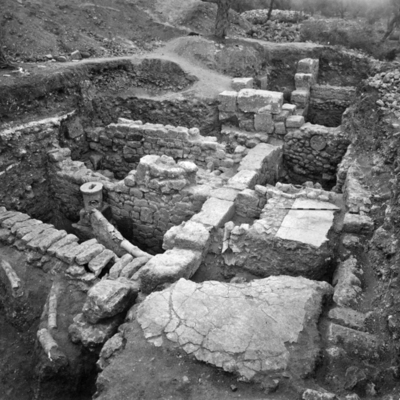 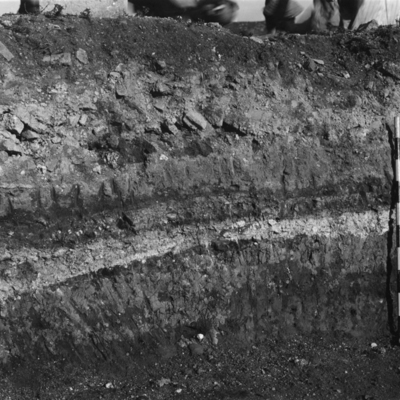 Excavation west of Rooms 1 & 2. 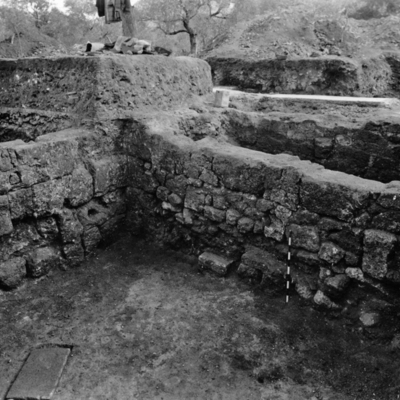 General view of Dig D Rooms 1 & 2. 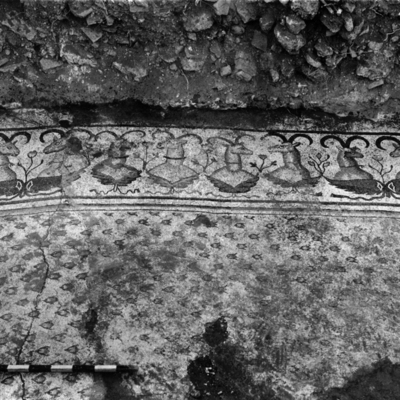 Drains and mosaic fragments under the Dionysus & Ariadne mosaic in Room 1. 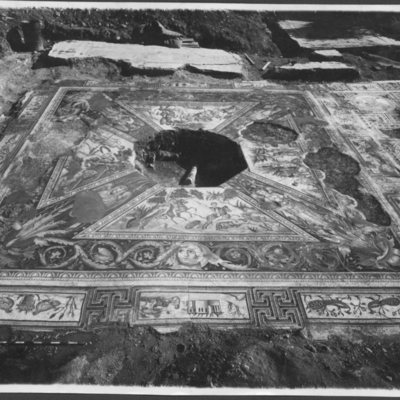 General view of the Seasons mosaic in Room 1. 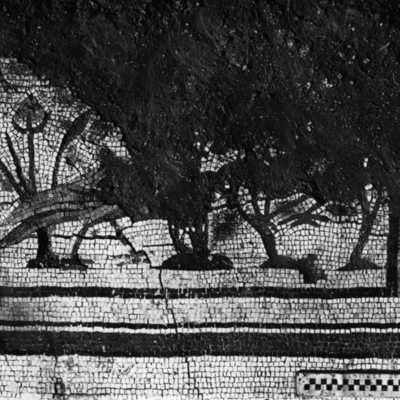 Detail view of the Seasons mosaic in Room 1. 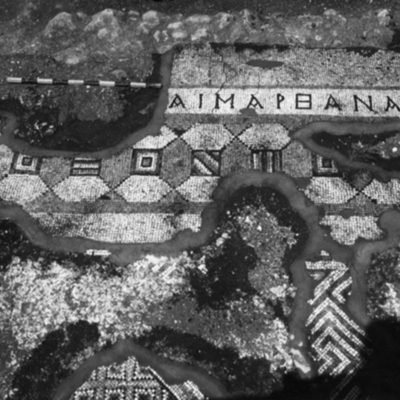 Detail of mosaic inscription 1. 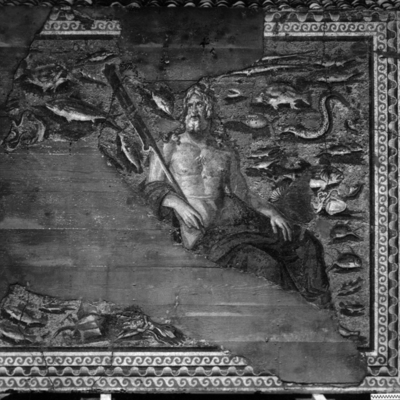 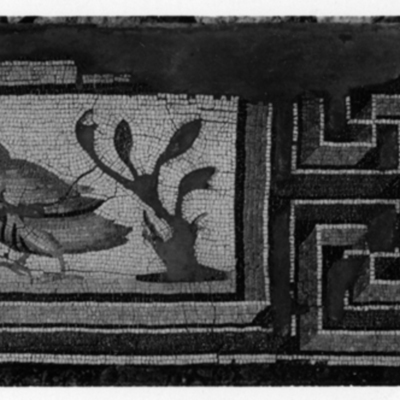 Mosaic of Room 1 showing Oceanus. 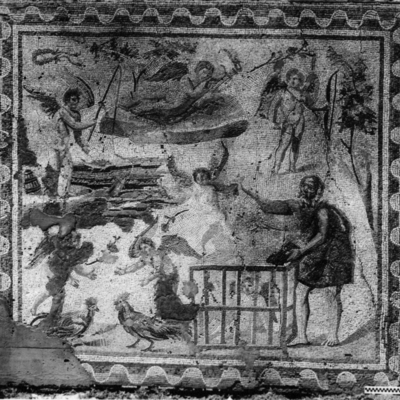 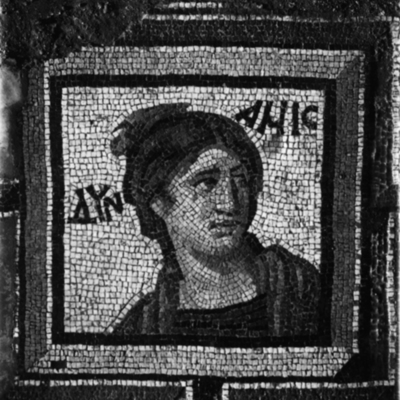 Mosaic of Room 1 showing Thetis. 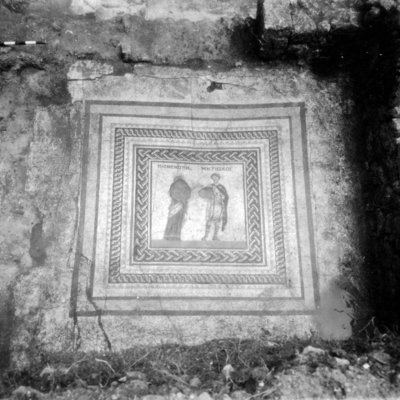 Mosaic of Room 1 the Calendar. 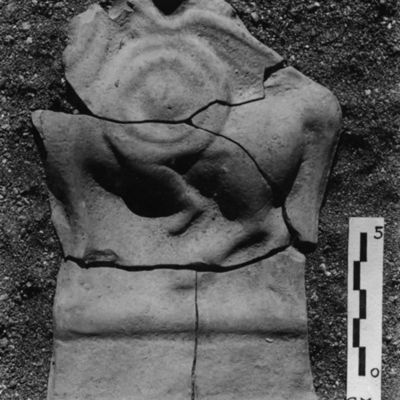 Raised panel A from Room 1 showing a figure and column. 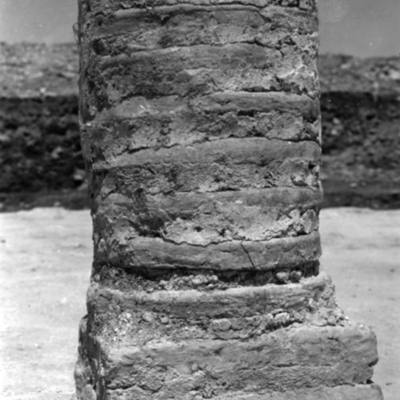 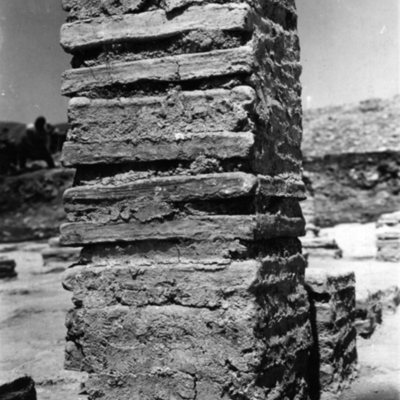 Raised panel C from Room 1 showing a figure column and sun dial. 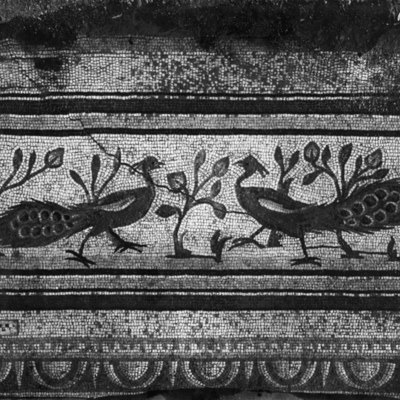 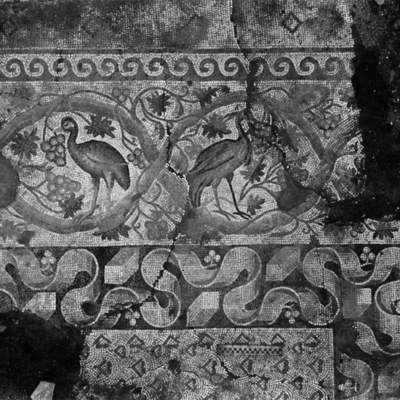 Detail of mosaic floor showing wreaths birds flowers and a peacock on a plain ground. 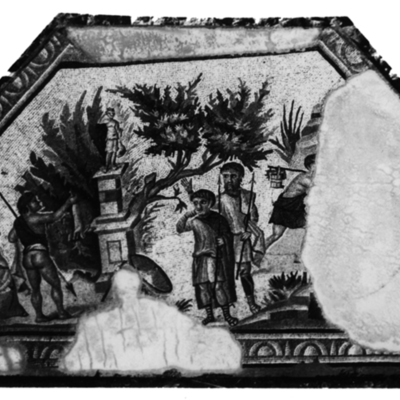 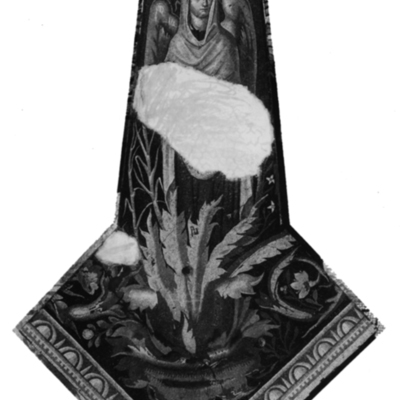 Raised fragment of the Calendar mosaic. 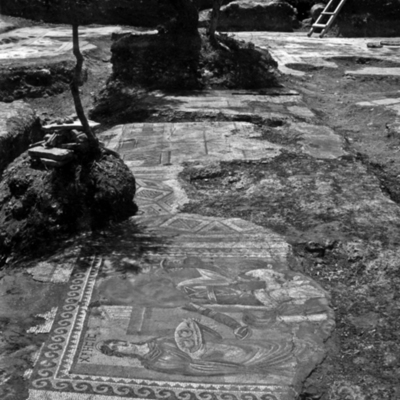 Excavation view of mosaics in Rooms 1 & 2 (corridor). 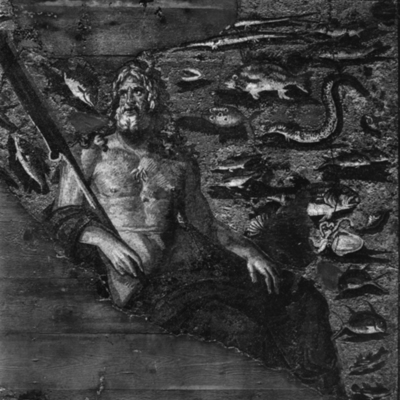 Detail of mosaic panel from Room 1 showing Oceanus. 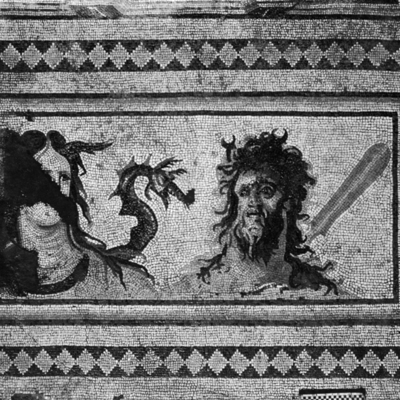 Detail of mosaic panel in Room 1 showing Oceanus. 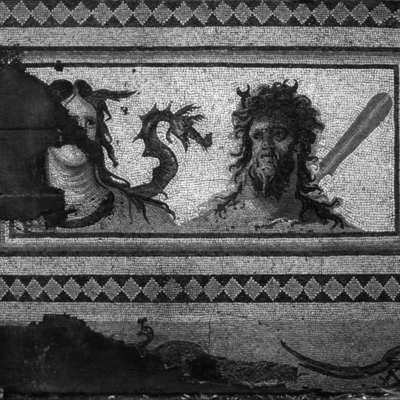 Detail of Oceanus panel from Room 1 close-up of head. 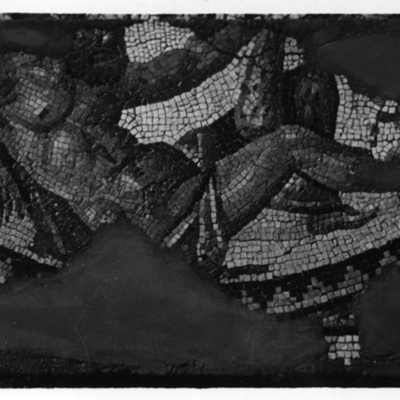 Detail of panel B with Dionysus and Ariadne. 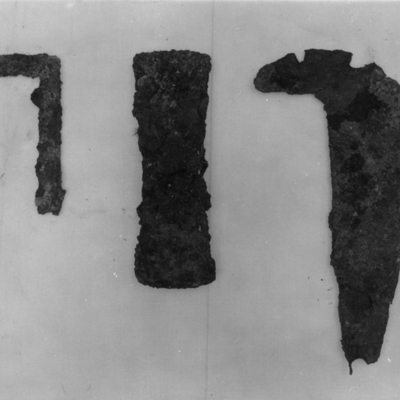 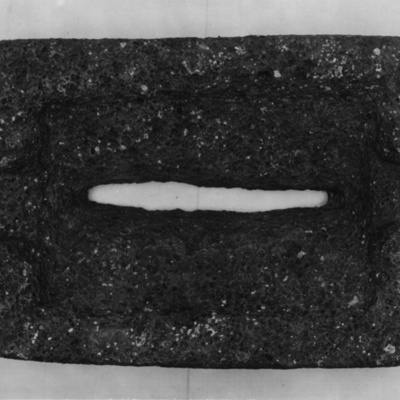 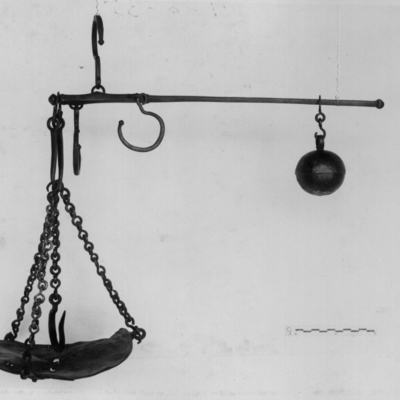 Bronze scale from over Room 1. 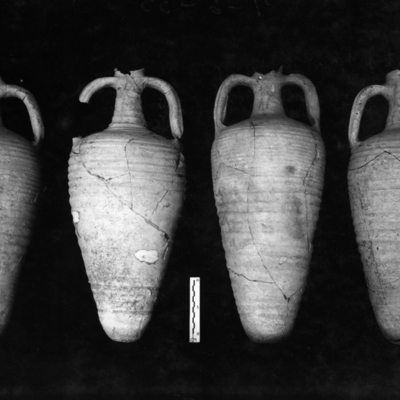 Wine amphorae from over Room 1. 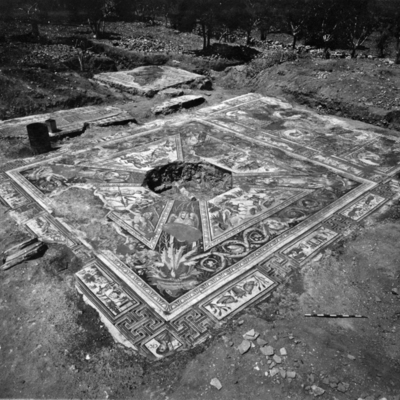 Excavation view of mosaic in Room 1 The Worcester Hunt with Room 3 in background. 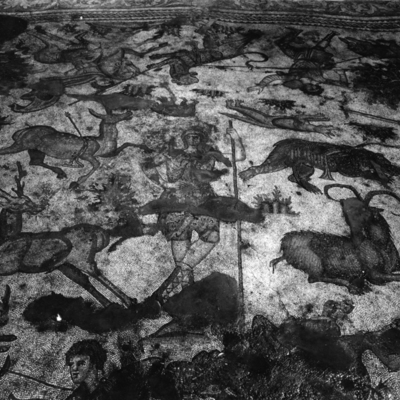 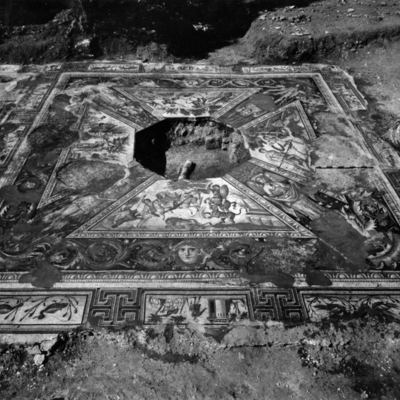 Excavation view of mosaic in Room 1 The Worcester Hunt with Room 2 in background. 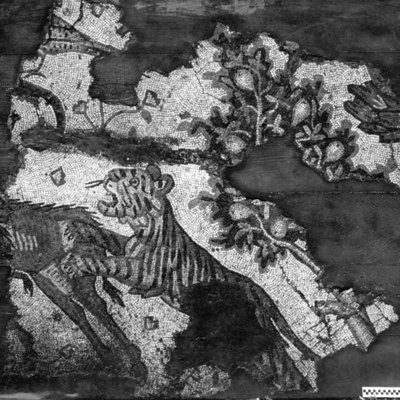 Detail of Worcester Hunt mosaic in Room 1 central figure. 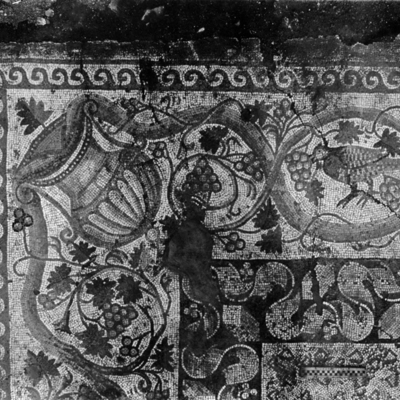 Detail of Worcester Hunt mosaic in Room 1 northern corner of pavement. 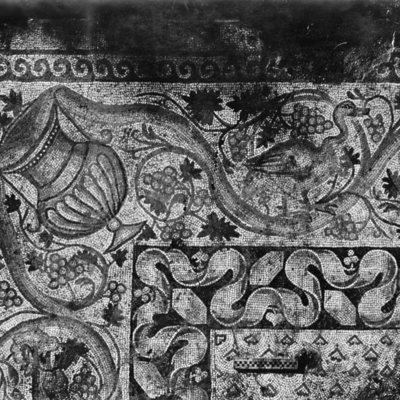 Detail of Worcester Hunt mosaic in Room 1 eastern corner of pavement. 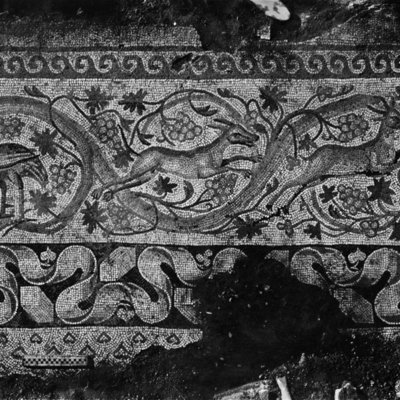 Detail of Worcester Hunt mosaic in Room 1 southern corner of pavement. 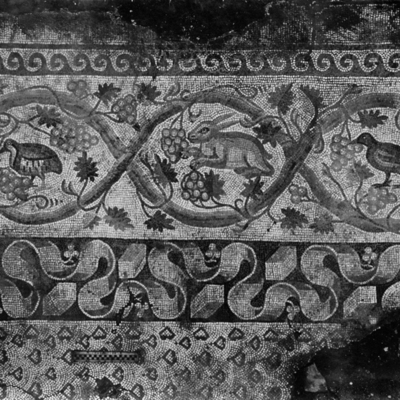 Detail of Worcester Hunt mosaic in Room 1 western corner of pavement. 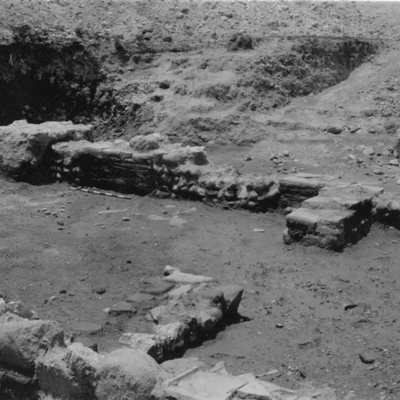 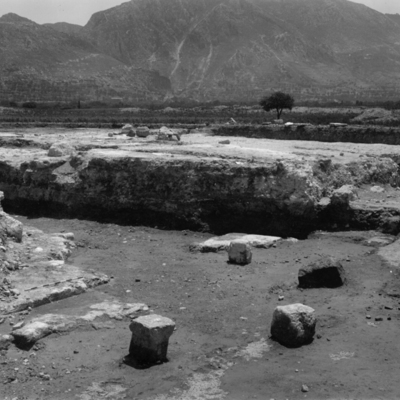 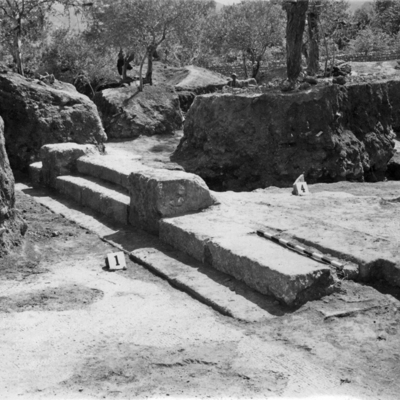 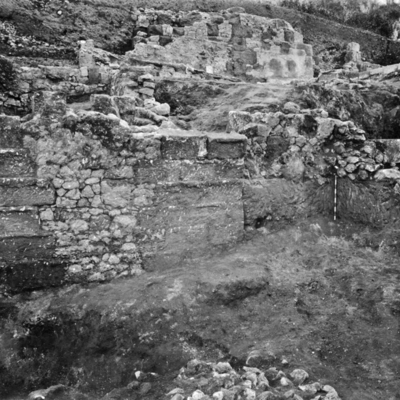 General view of excavations and mosaic under Room 1. 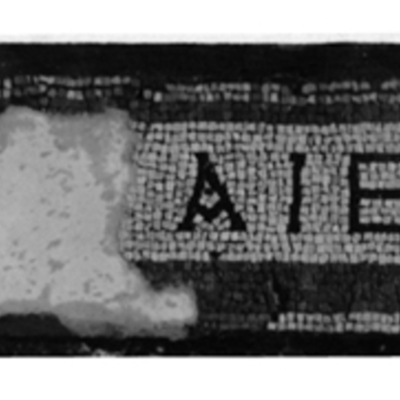 View of mosaic inscription 2 sections 1 & 2 in Room 1. 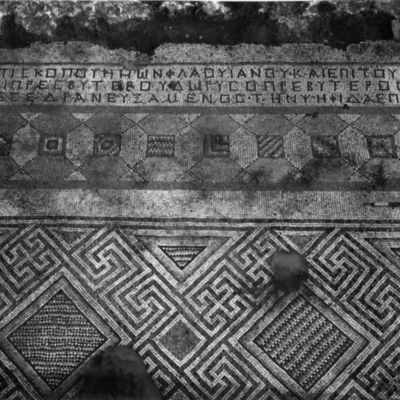 View of mosaic inscription 2 section 3 in Room 1. 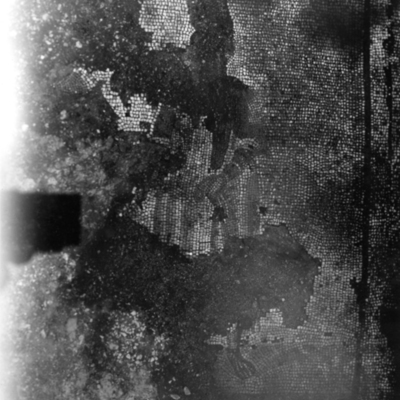 Detail of tomb in Room 1 with inscription 1 at top. 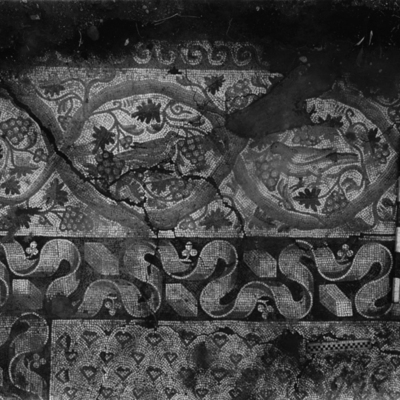 Detail of tomb outside west wall of Room 1. 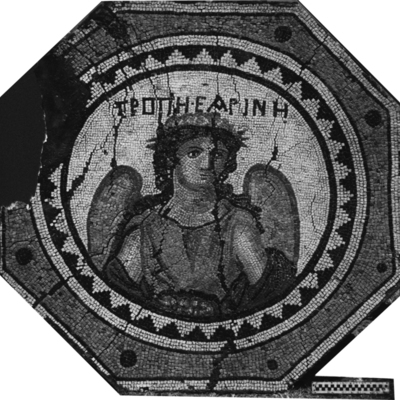 Raised central medallion showing Ge. 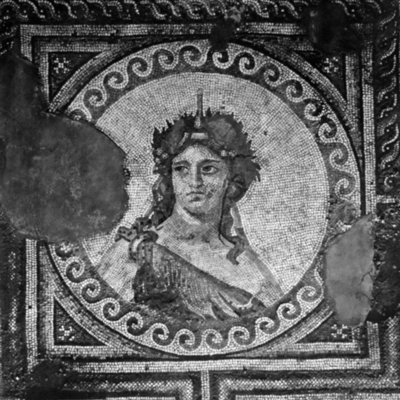 Raised medallion showing personification of Summer. 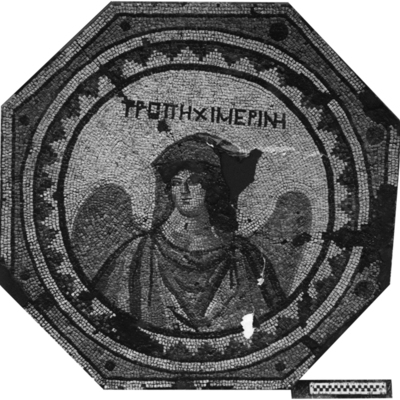 Raised medallion showing personification of Spring. 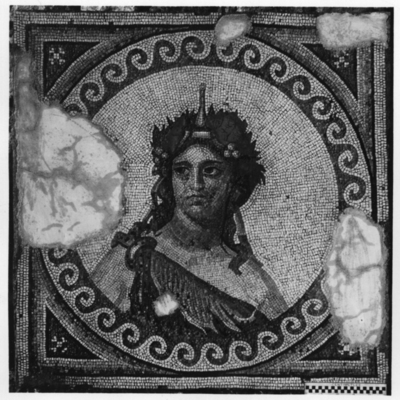 Raised medallion showing personification of Winter. 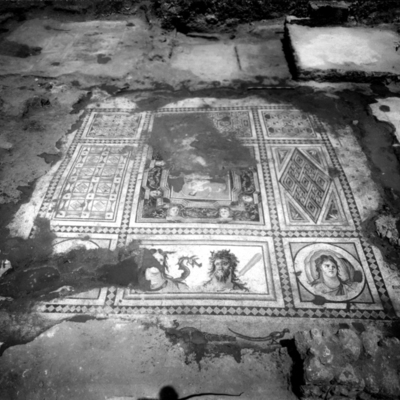 General view of mosaics in Room 1. 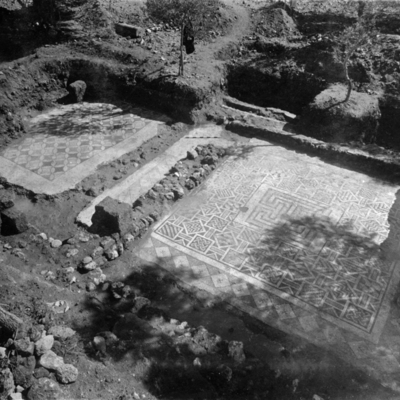 General view of excavations under the mosaic floors. 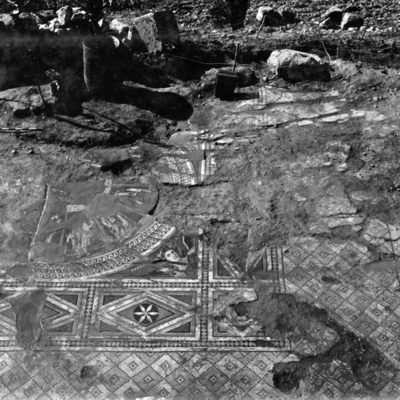 Detail of excavations under the mosaic floors Room 1. 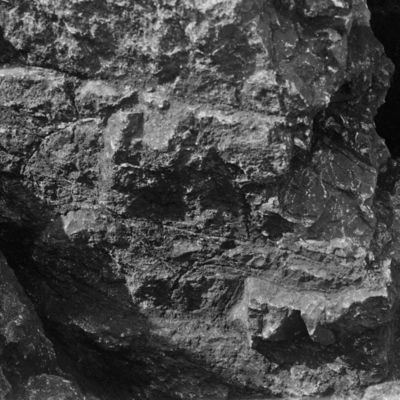 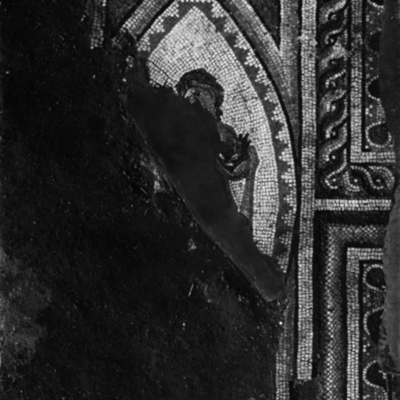 Detail of exacavtions under mosaic of Room 1. 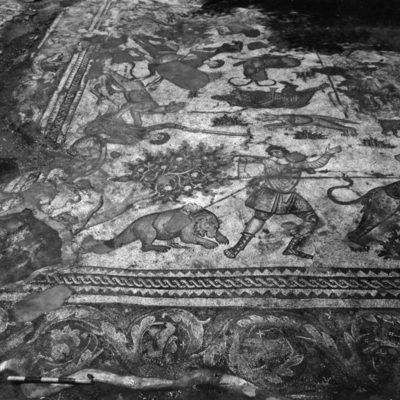 Central section of the Worcester Hunt mosaic from Room 1 raised. 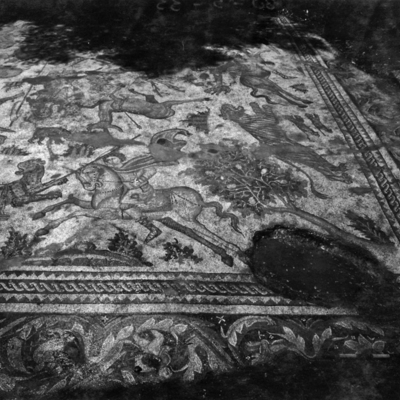 Northeast section of the Worcester Hunt mosaic from Room 1 raised. 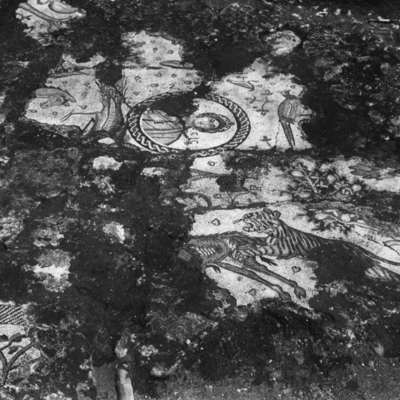 Southeast section of the Worcester Hunt mosaic from Room 1 raised. 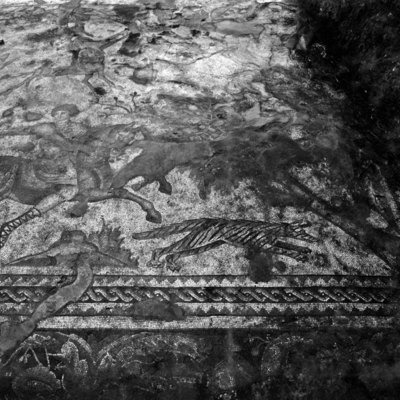 Southwest section of the Worcester Hunt mosaic from Room 1 raised. 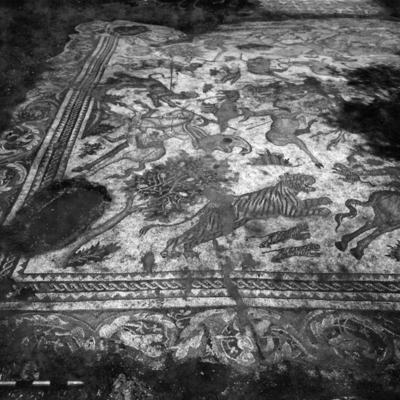 Northwest section of the Worcester Hunt mosaic from Room 1 raised. 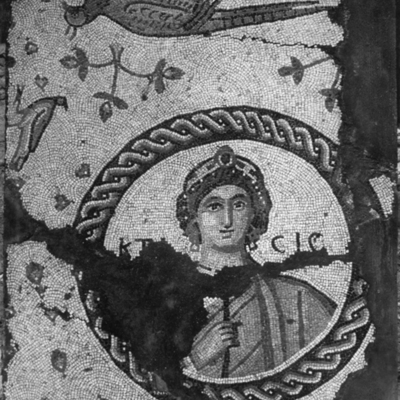 Mosaic panel A from Room 1 medallion with head of a goddess. 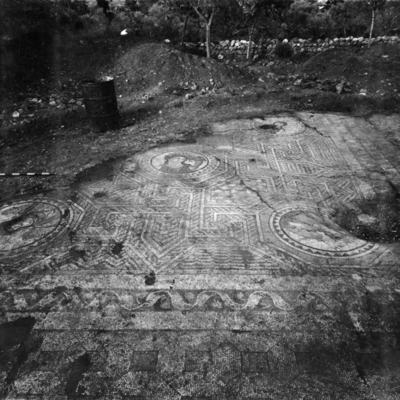 General view of mosaic floor in Room 1 the octagonal fountain area. 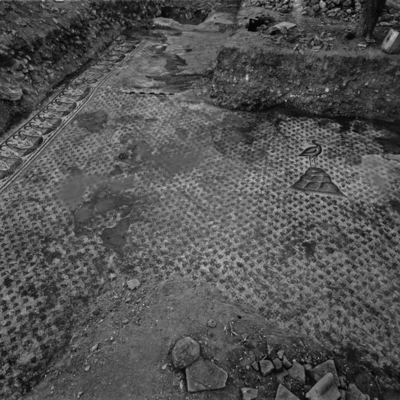 General view of mosaic floor in Room 1 looking into Rooms 2 & 3. 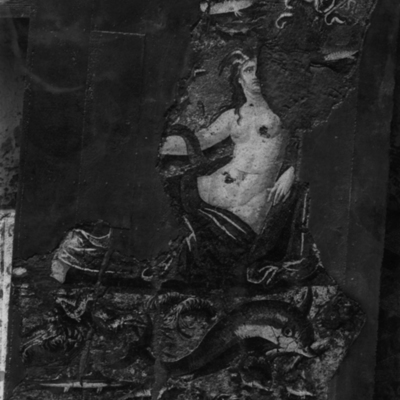 Detail of medallion panel W in Room 1 Silenus. 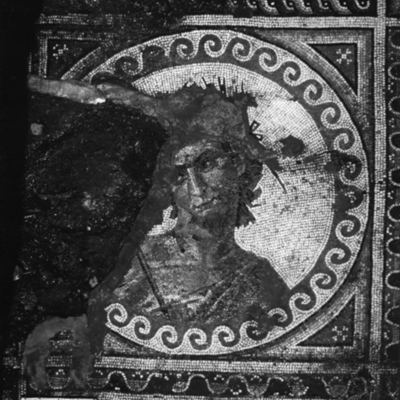 Detail of medallion panel V in Room 1 Dionysus. 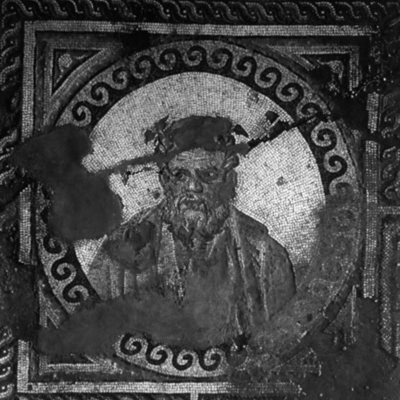 Detail of medallion panel Y in Room 1 satyr. 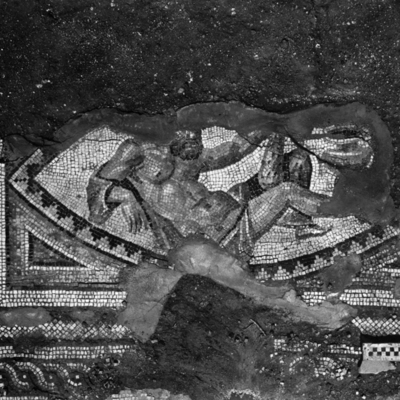 Detail of elliptical medallion panel AA in Room 1 Herakles reclining. 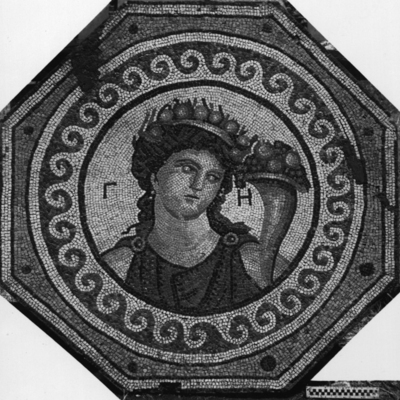 Detail of elliptical medallion panel Z in Room 1 maenad. 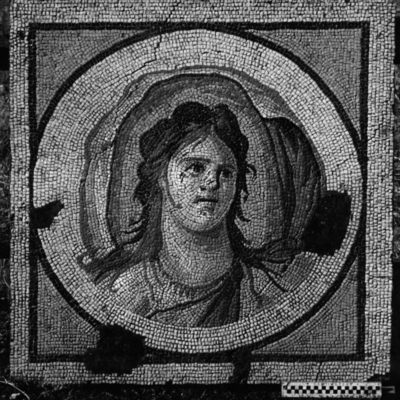 Detail of medallion panel AD in Room 1 Female bust (not raised). 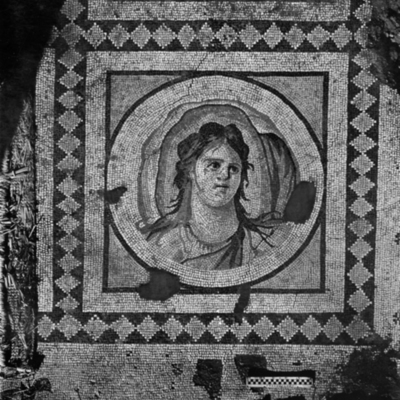 Detail of medallion panel AC in Room 1 Female bust (not raised). 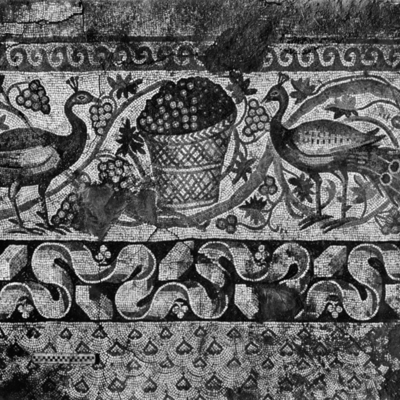 Detail of border panel U' in Room 1 birds (not raised). 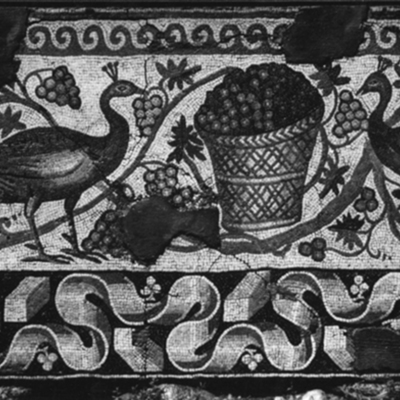 Detail of border panel U in Room 1 quail. 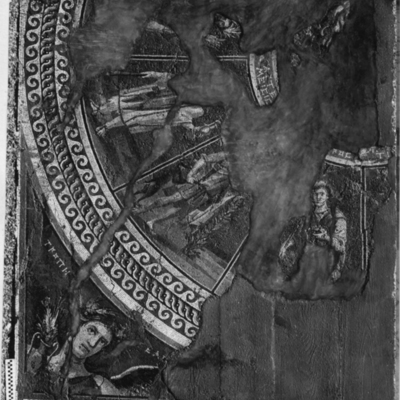 Detail of border panel J in Room 1 personification. 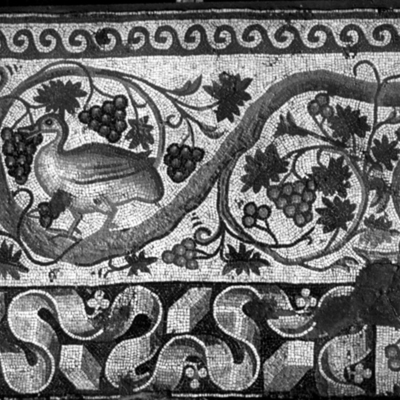 Detail of mosaic in Room 1 panel J' from border peacocks. 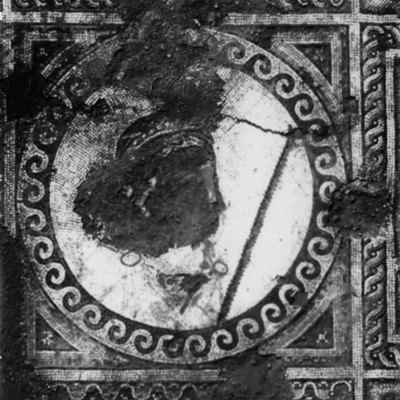 Section 5 of raised rinceau border from Room 1. 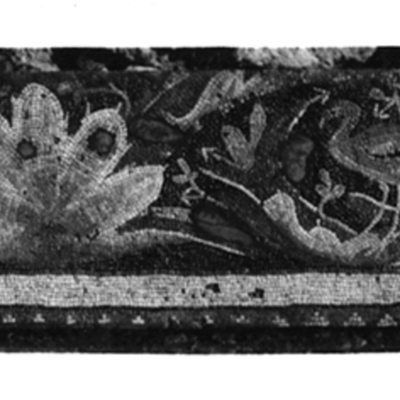 Section 2 of raised rinceau border from Room 1. 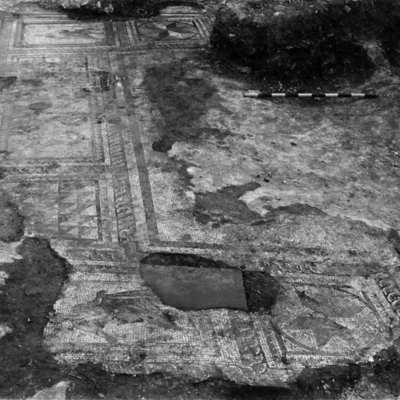 Section 4 of raised rinceau border from Room 1. 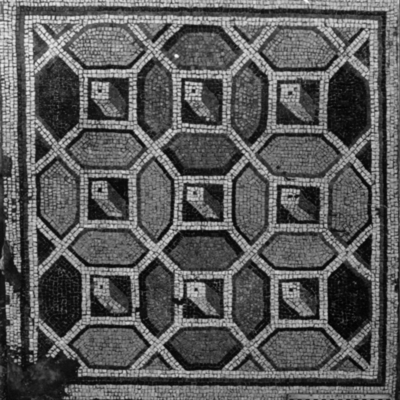 Section 6 of raised rinceau border from Room 1. 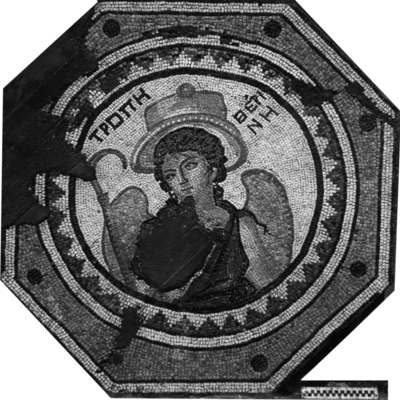 Raised central medallion of Ktisis. 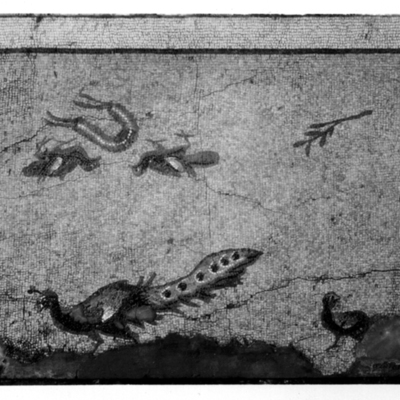 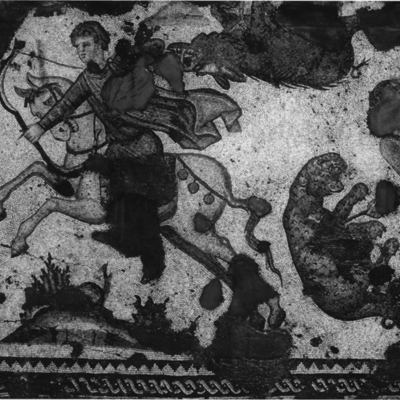 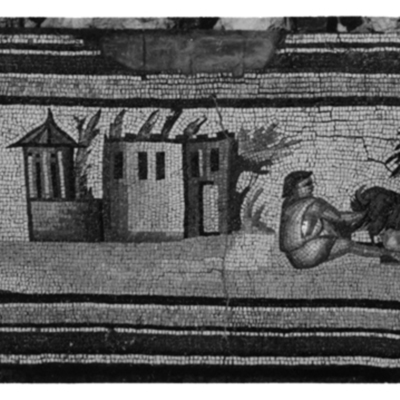 Raised section of Room 1 mosaic tiger attacking another animal. 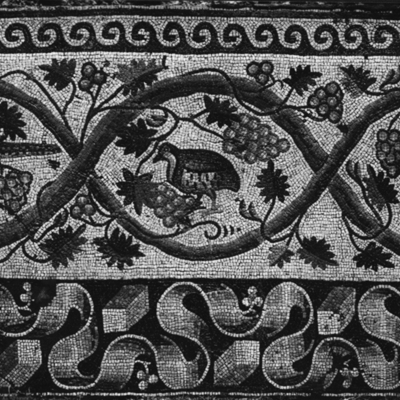 Raised section 1 of Phoenix mosaic ram's head border with carpet pattern. 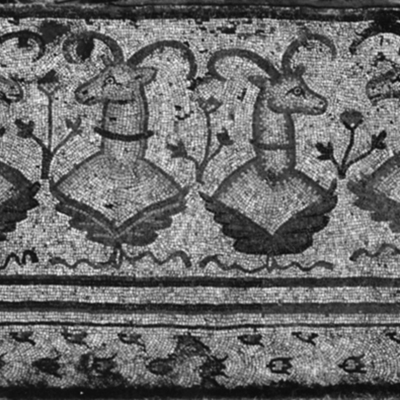 Raised section 2 of Phoenix mosaic ram's head border with carpet pattern. 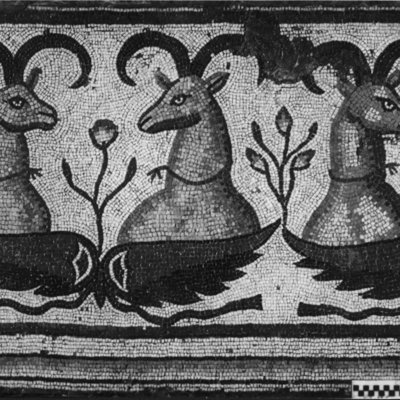 Raised section 3 of Phoenix mosaic ram's head border with carpet pattern. 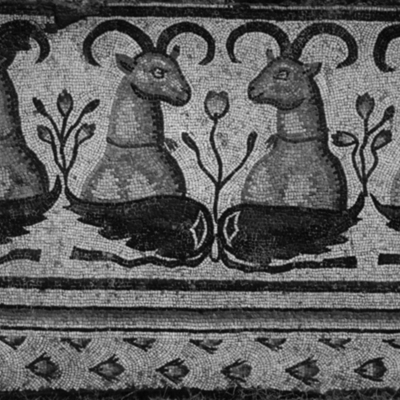 Raised section 4 of Phoenix mosaic ram's head border. 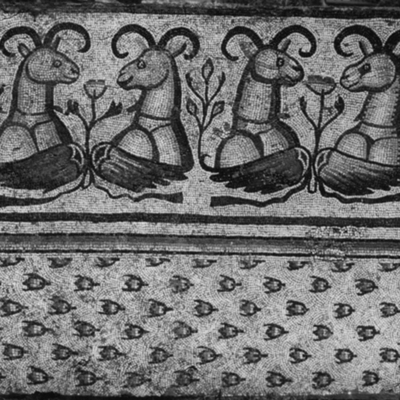 Raised section 5 of Phoenix mosaic ram's head border. 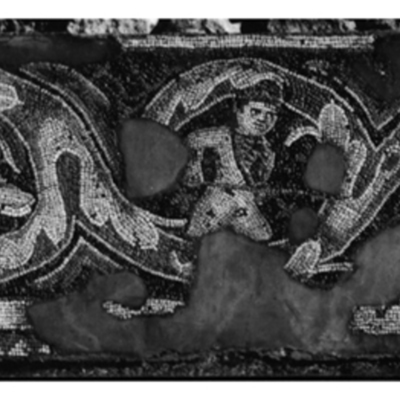 Raised section 6 of Phoenix mosaic ram's head border. 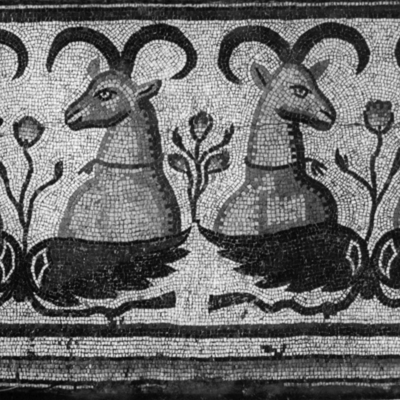 Raised section 7 of Phoenix mosaic ram's head border with carpet pattern. 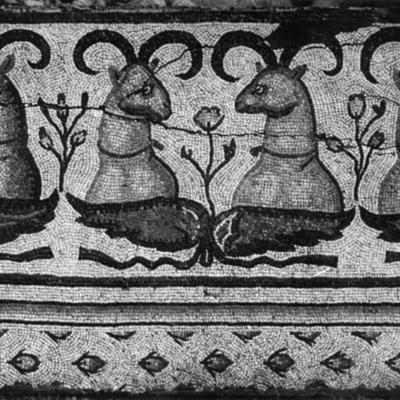 Raised section 8 of Phoenix mosaic ram's head border with carpet pattern. 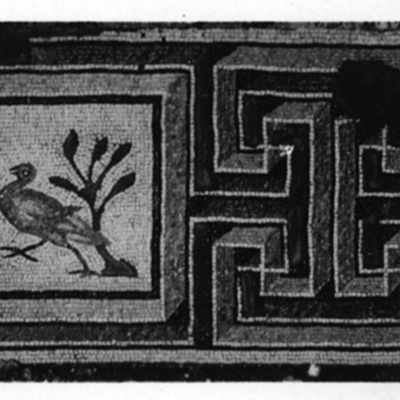 Raised section 9 of Phoenix mosaic showing the Phoenix. 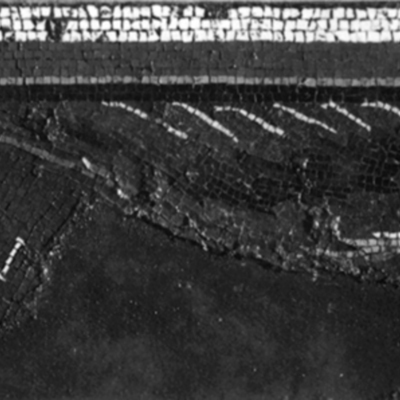 Detail of canal under mosaic floor of Room 1. 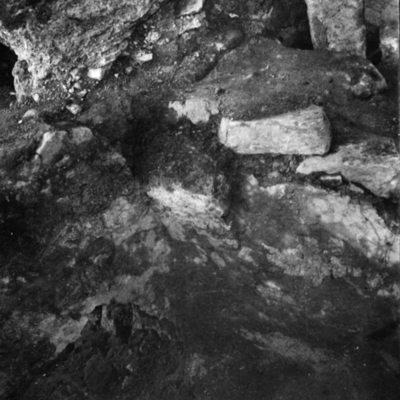 Detail of stratigraphy under mosaic floor of Room 1. 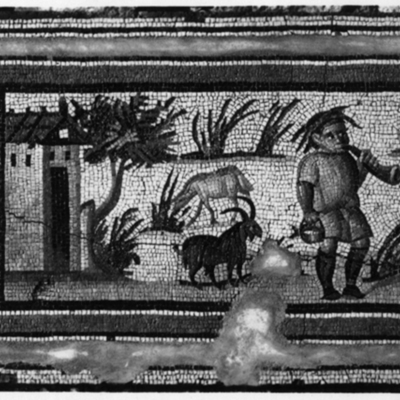 Raised border panel A from Room 1 a shepherd blowing a horn. 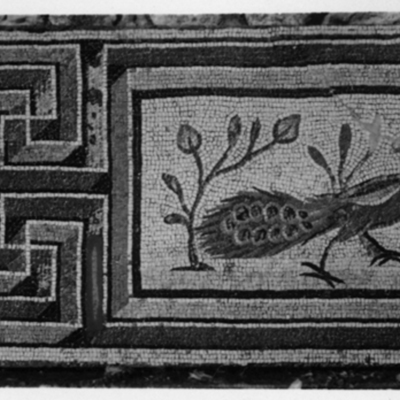 Raised border panel B from Room 1 two birds. 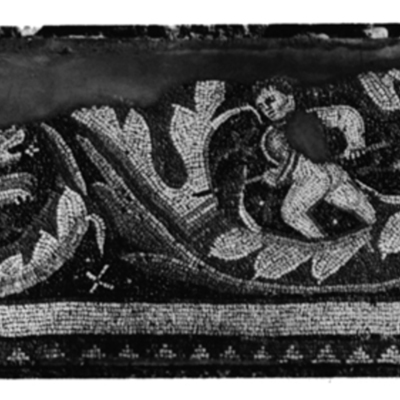 Raised border panel C from Room 1 male and female figures harvesting. 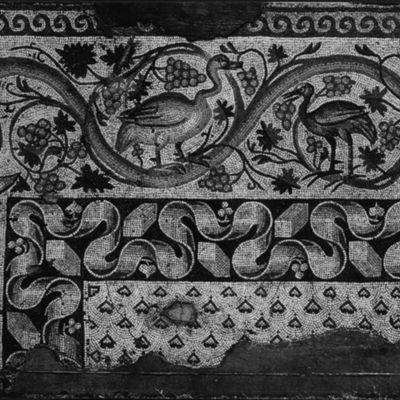 Raised border panel D' from Room 1 two birds. 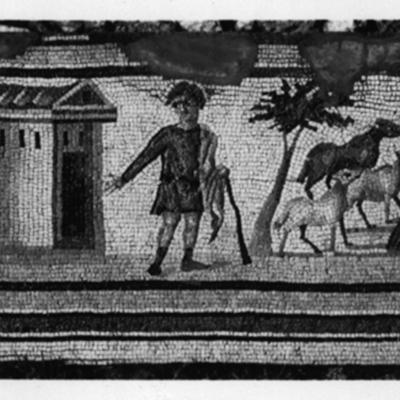 Raised border panel E from Room 1 a shepherd with his flock. 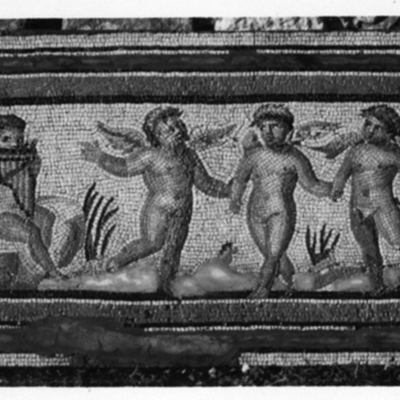 Raised border panels F and F' from Room 1 two birds and a personification. 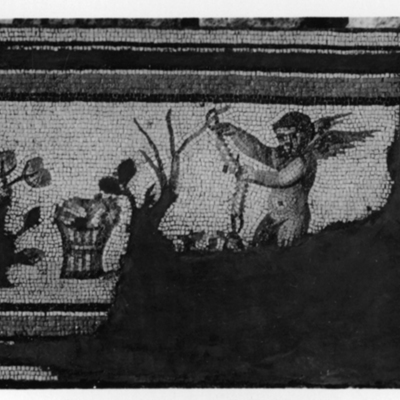 Raised border panel G from Room 1 erotes gathering flowers. 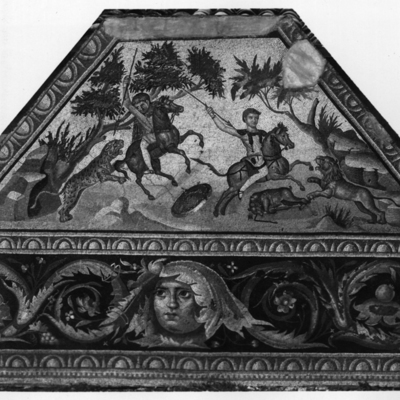 Raised border panel H from Room 1 reclining erotes. 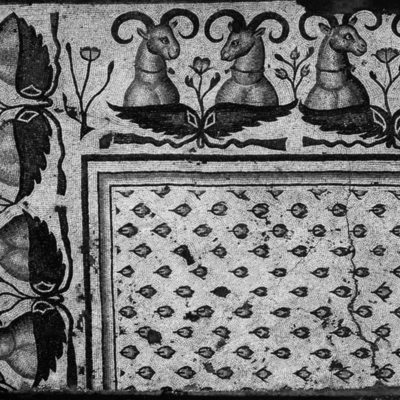 Raised border panel I from Room 1 dancing erotes. 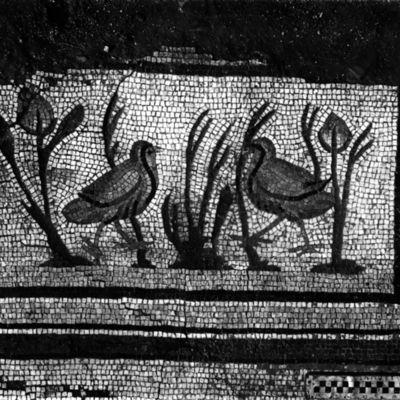 Raised border panels J and J' from Room 1 personification and two birds. 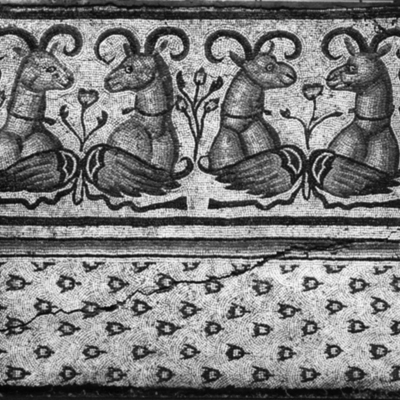 Raised border panel K from Room 1 shepherd and goats under a tree. 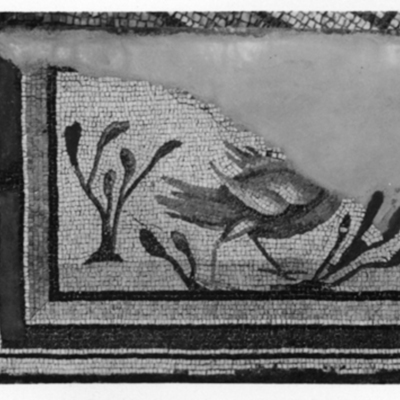 Raised border panels L & L' from Room 1two birds and personification. 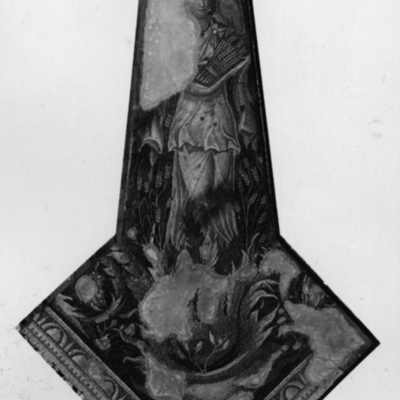 Raised panel M from Room 1 female representation of Winter. 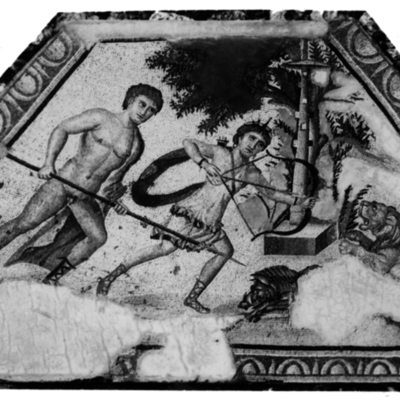 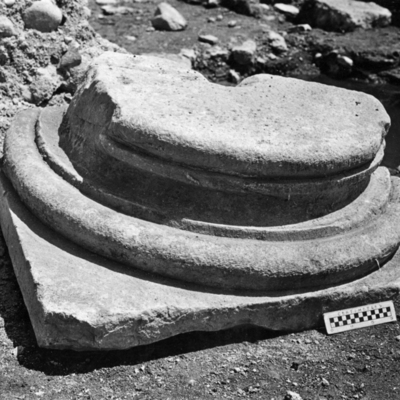 Raised trapezoidal panel N from Room 1 Artemis hunting a lion & boar. 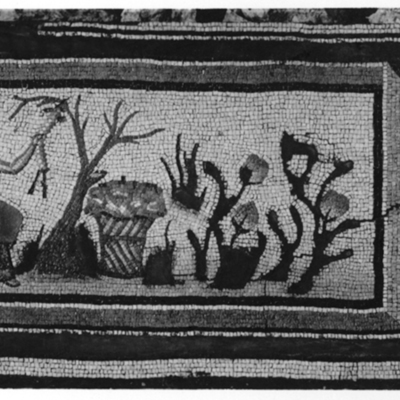 Raised panel O from Room 1 female representation of Spring. 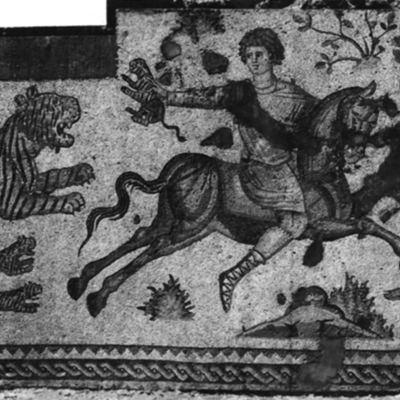 Raised trapezoidal panel P from Room 1 three mounted hunters and a bear lion & tiger. 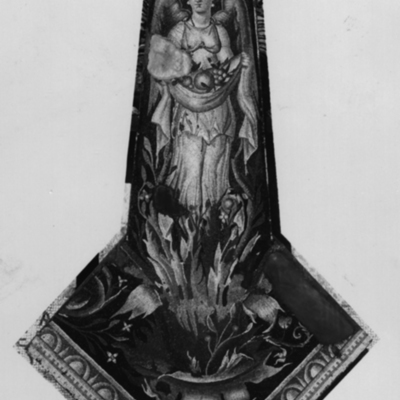 Raised panel Q from Room 1 female representation of Summer. 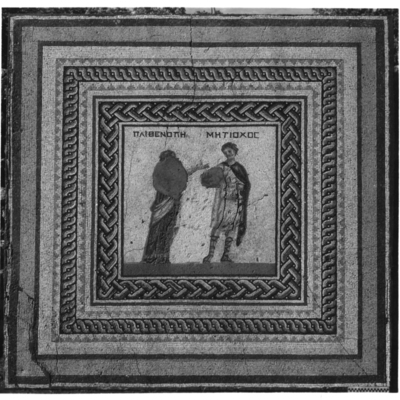 Raised trapezoidal panel R from Room 1 hunters offering gifts to statue of Artemis. 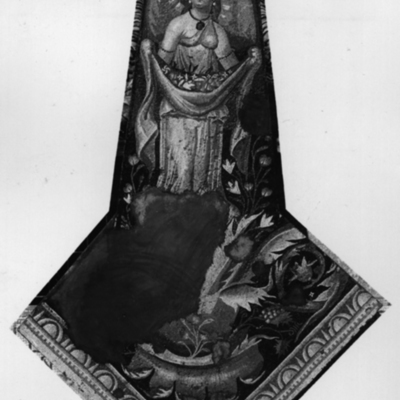 Raised panel S from Room 1 female representation of Autumn. 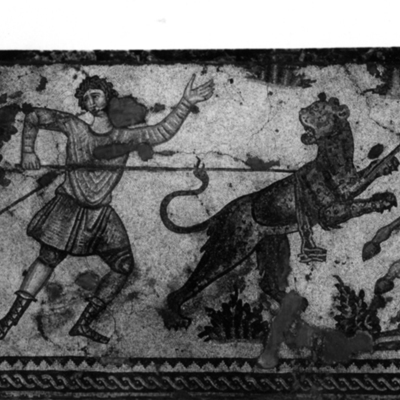 Raised trapezoidal panel T from Room 1 two mounted hunters with leopard & lion. 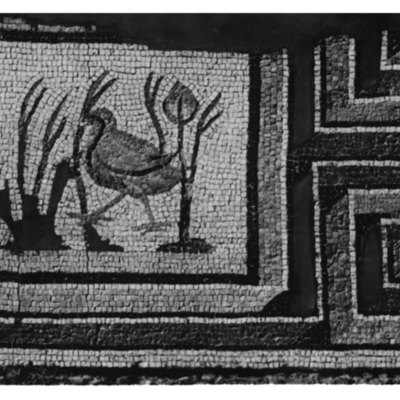 Raised border panel U from Room 1 two birds. 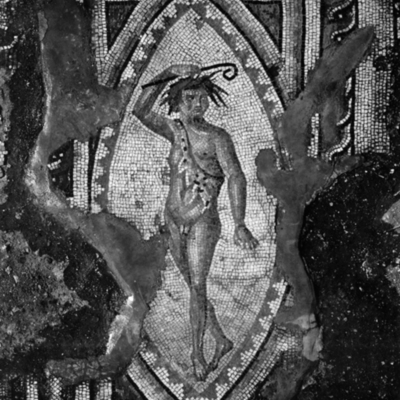 Raised medallion panel V Dionysus. 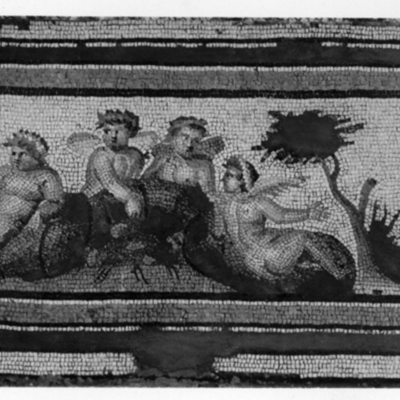 Raised medallion panel W Silenus. 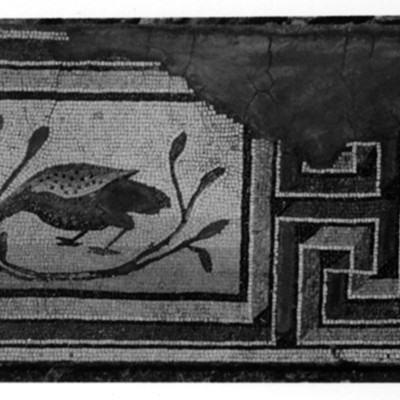 Raised border panels X and X' from Room 1 birds. 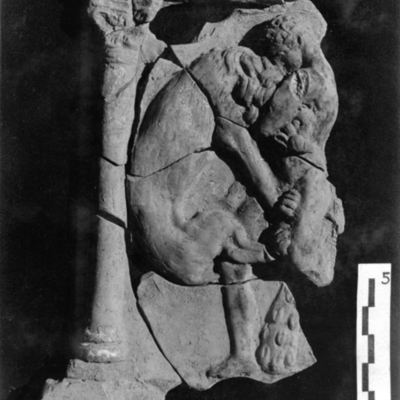 Raised medallion panel Y a Satyr. 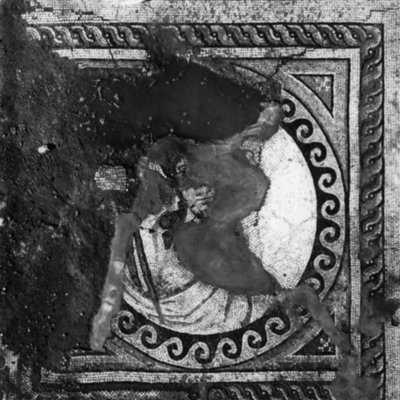 Raised elliptical medallion panel Z a dancing maenad. 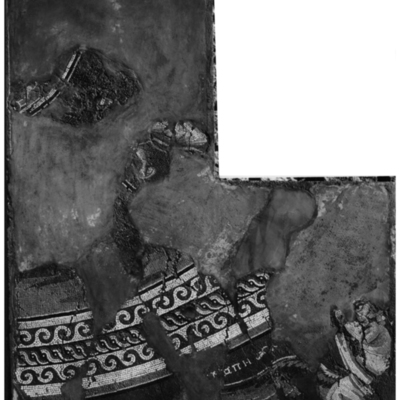 Raised elliptical medallion panel AA Herakles reclining. 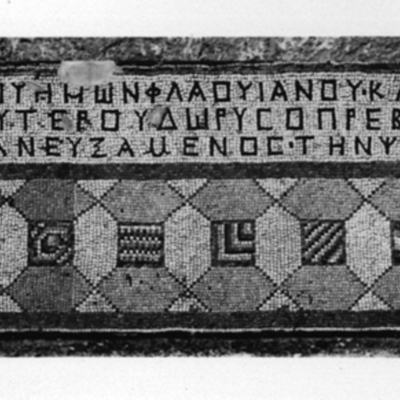 Mosaic inscription 1 from Room 1. 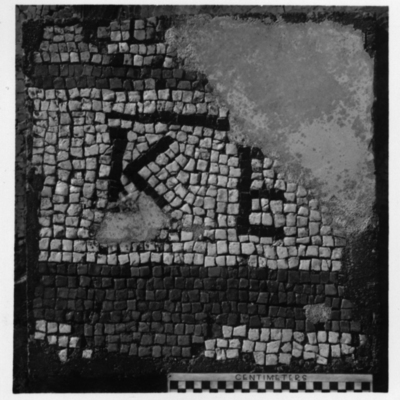 Fragment C of mosaic inscription 2 from Room 1. 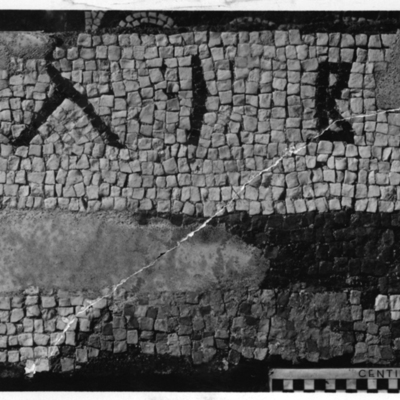 Fragment B of mosaic inscription 2 from Room 1. 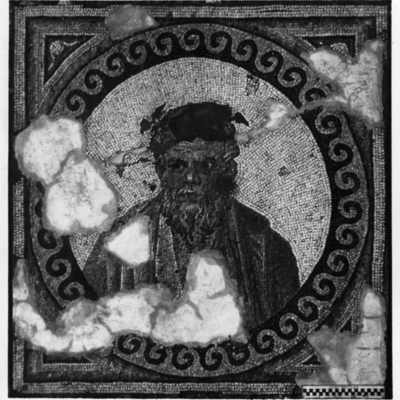 Fragment D of mosaic inscription 2 from Room 1. 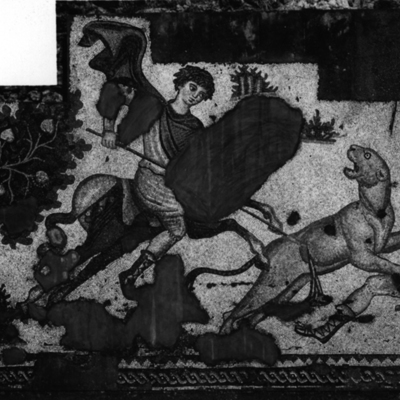 Raised rinceau border from the Worcester Hunt mosaic. 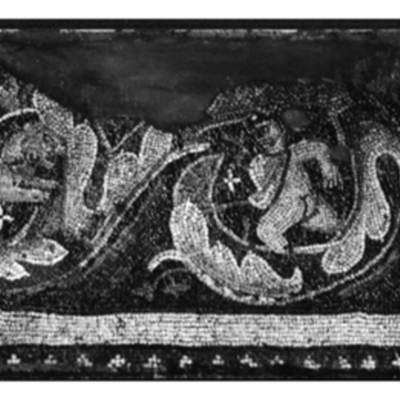 Raised mosaic panel A from Room 1 geometric border. 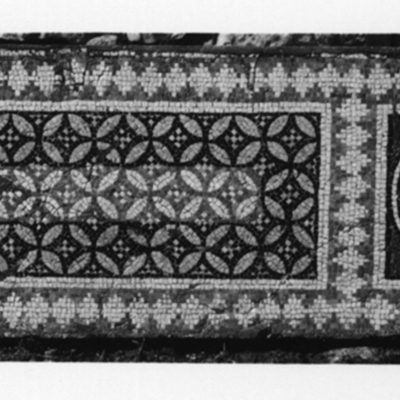 Raised mosaic panel C from Room 1 geometric border. 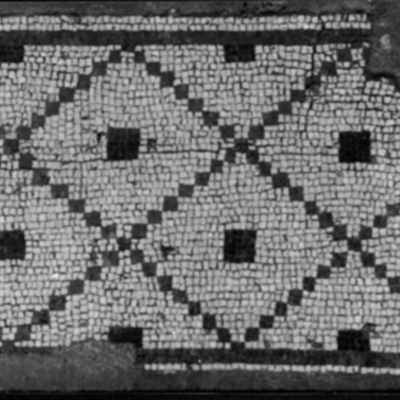 Geometric mosaic panel raised from floor of sub-room 1. 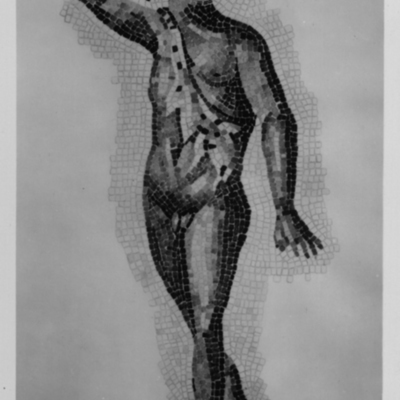 Watercolor rendering of a dancing satyr from the mosaic of Room 1 panel AB. 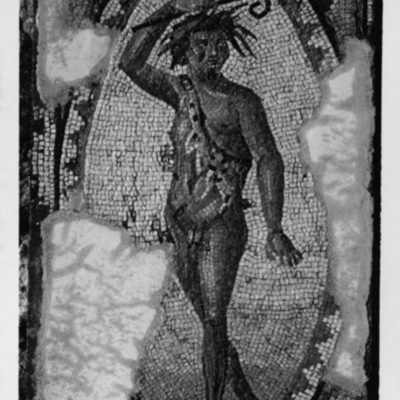 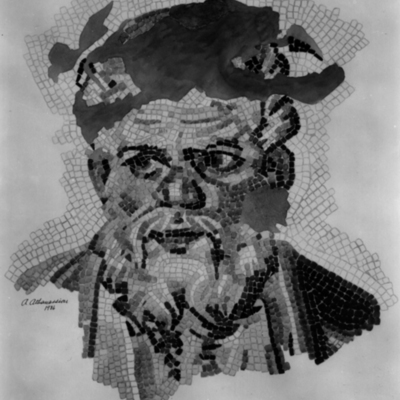 Watercolor rendering of Silenus from the mosaic of Room 1 panel W.
Colonettes found on top of Hunt mosaic. 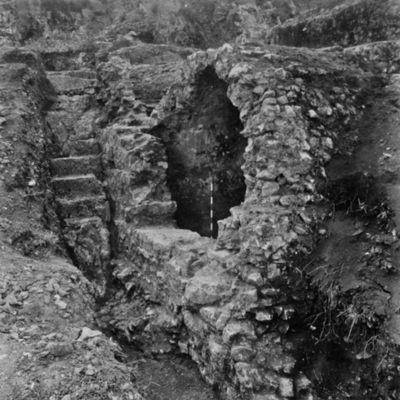 Stairway and vault under Room 1. 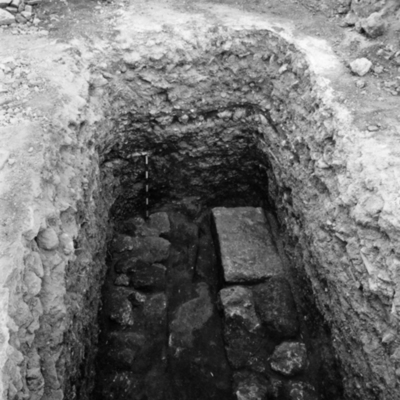 Entrance to vault under Room 1. 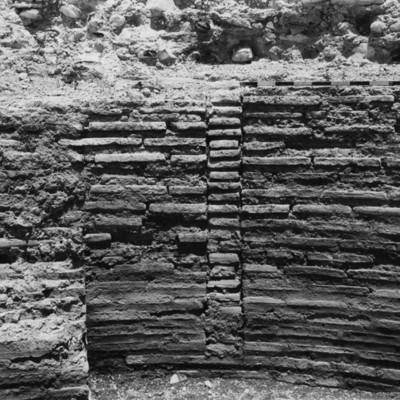 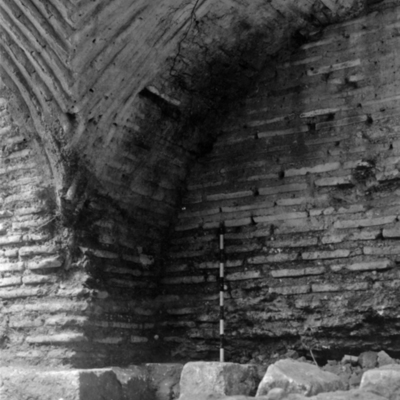 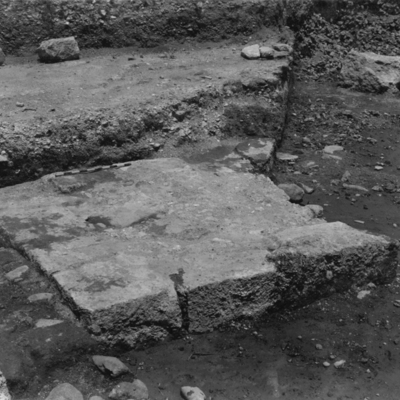 Detail of masonry in front of vault under Room 1. 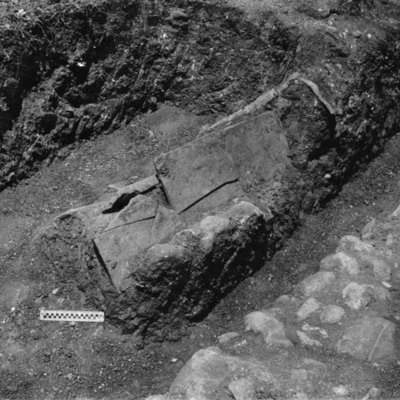 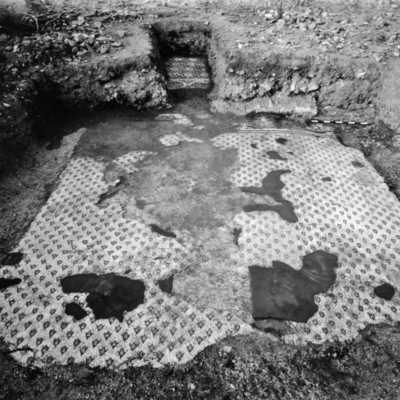 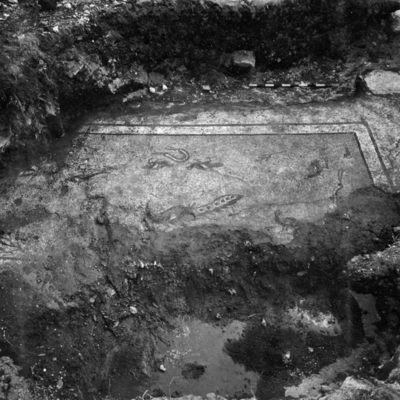 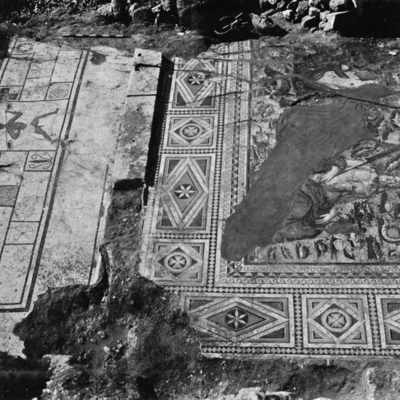 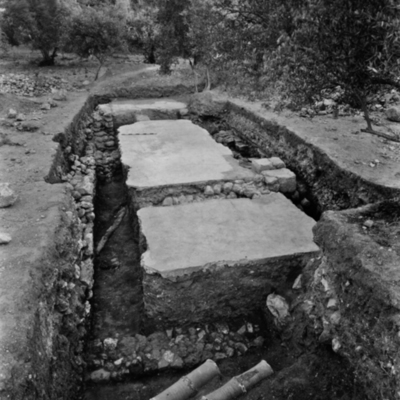 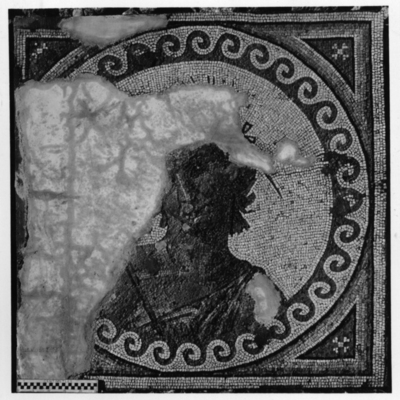 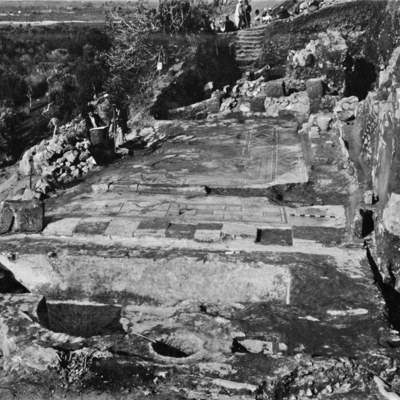 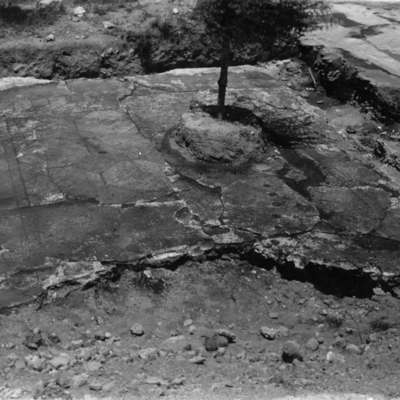 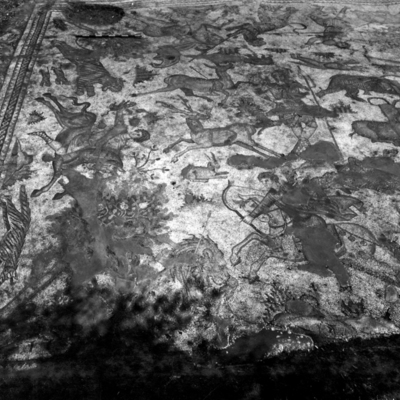 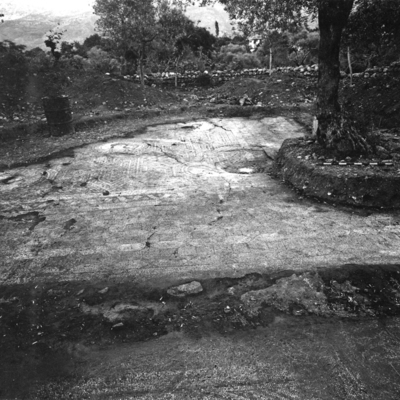 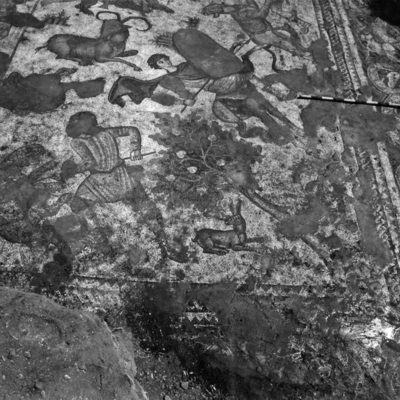 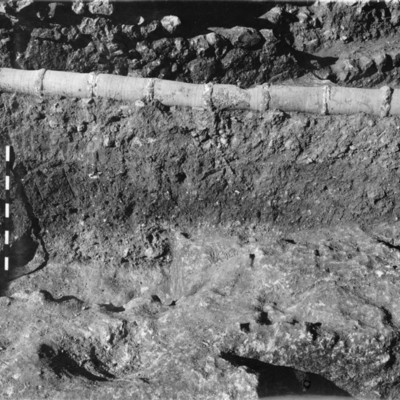 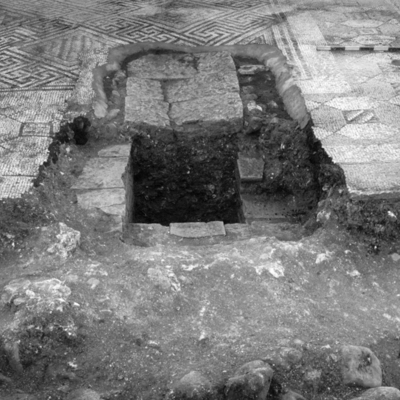 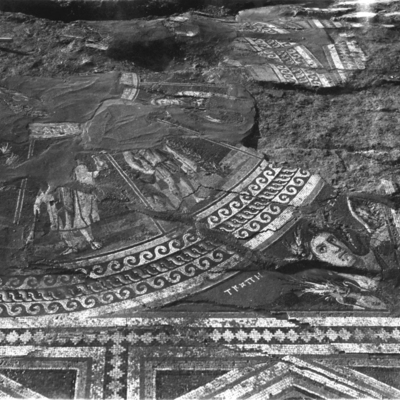 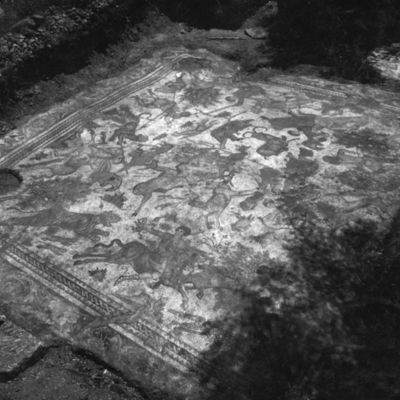 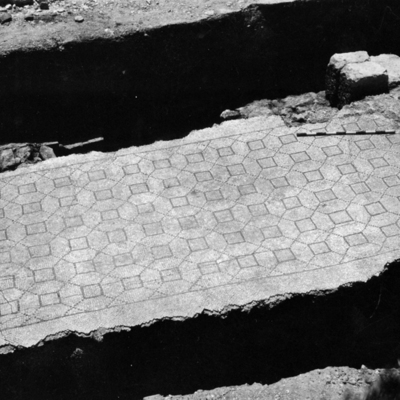 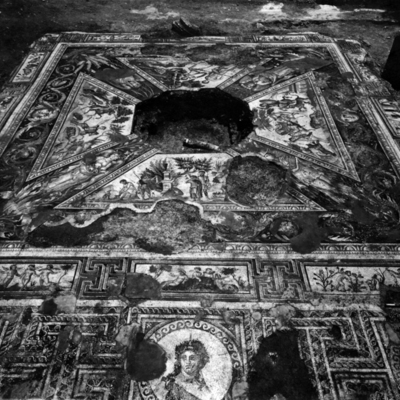 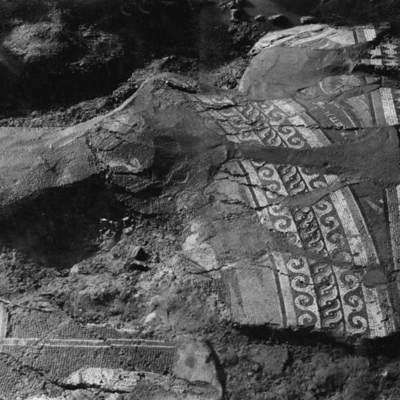 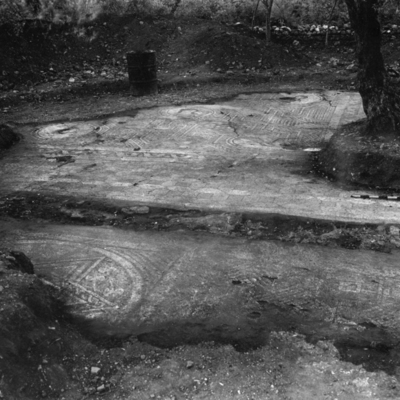 Excavation view of mosaic floor in Room 1 showing Parthenope and Metiochos. 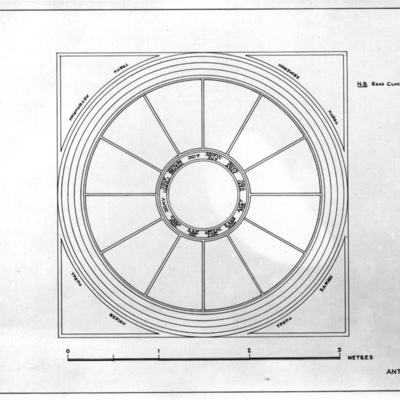 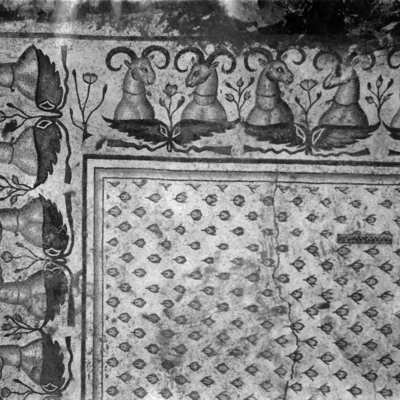 Plan of the calendar with inscriptions restored. 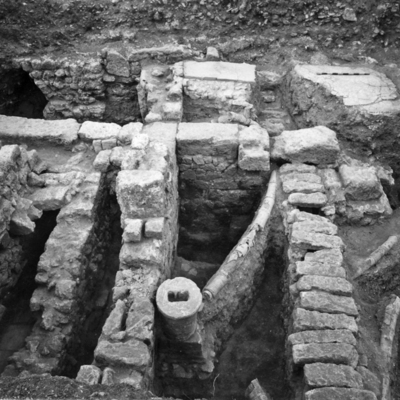 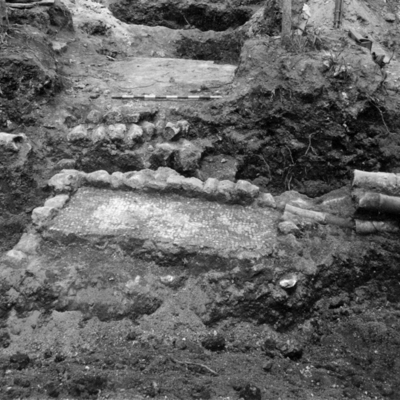 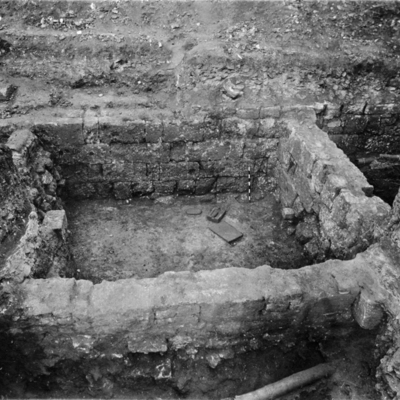 General view of excavations under Rooms 1 2 3 4 & 5. 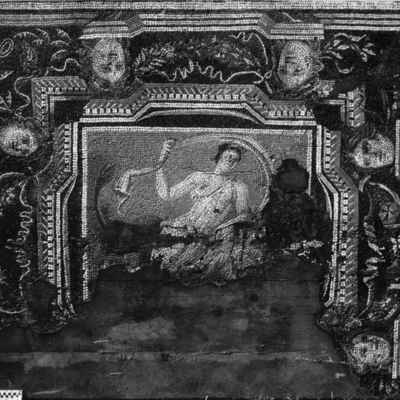 Raised panel A from Room 1 showing a winged female figure (Psyche?) 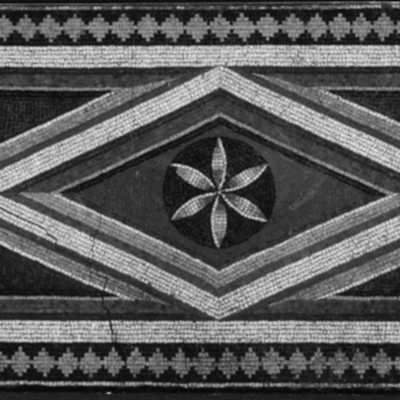 and border. 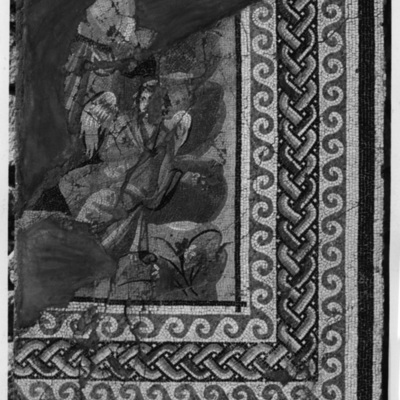 Raised panel B from Room 1 showing a section of the geometric border. 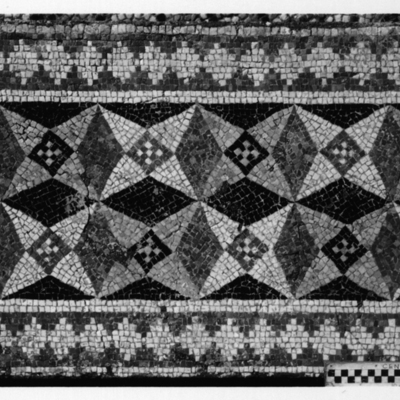 Raised panel C from Room 1 showing a section of the geometric border. 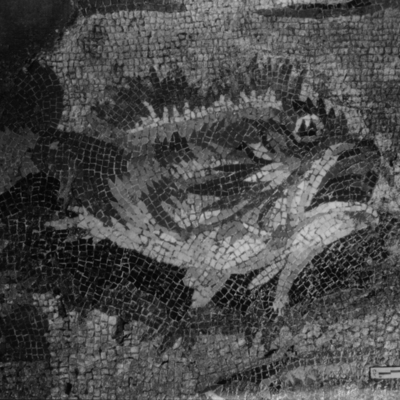 Detail of mosaic panel C showing a fish. 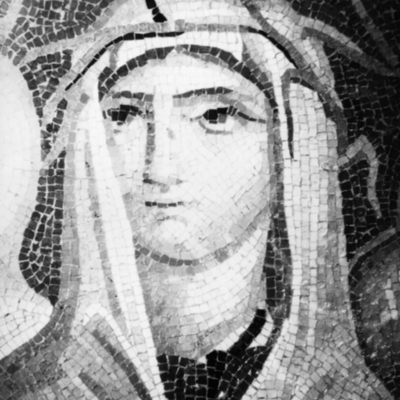 Detail of mosaic panel B showing the head of Ge. 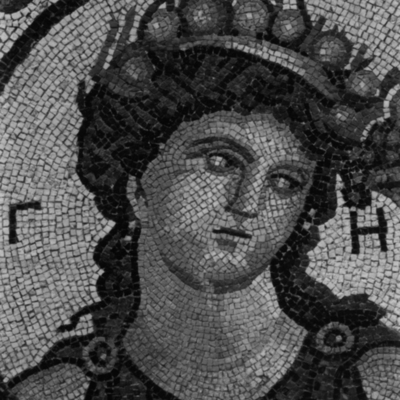 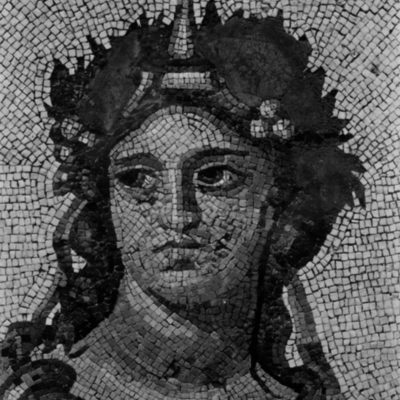 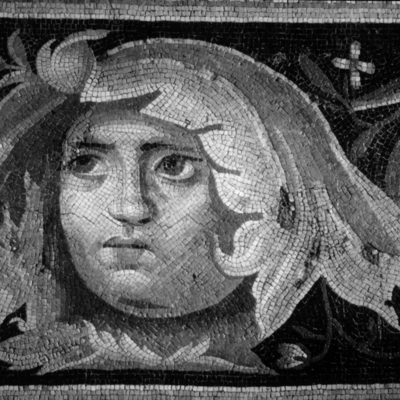 Detail of mosaic panel M head of the personification of Winter. 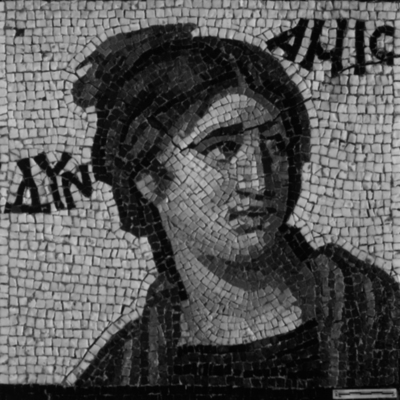 Detail of mosaic panel J head of Dynamis. 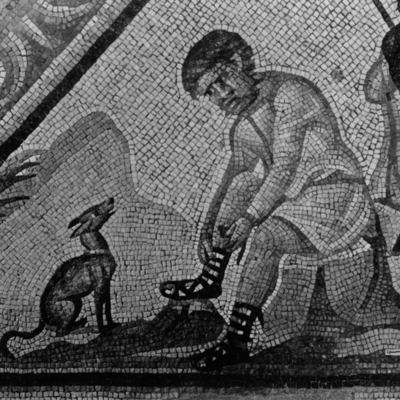 Detail of mosaic panel R man tying his sandal. 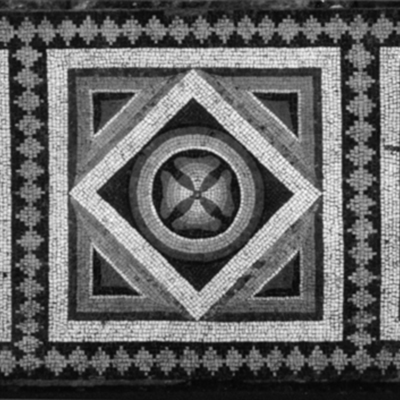 Detail of mosaic panel T face in rinceau. 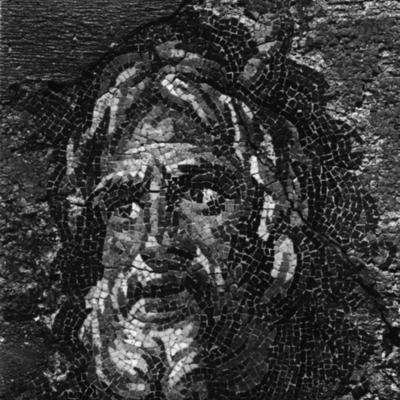 Detail of mosaic panel V head of Dionysus. 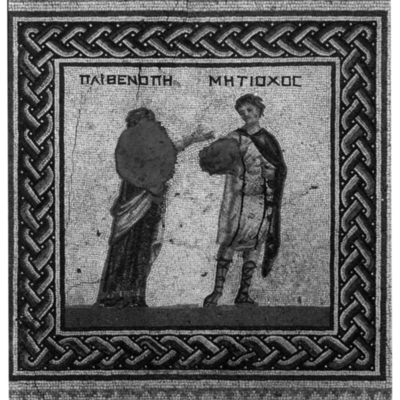 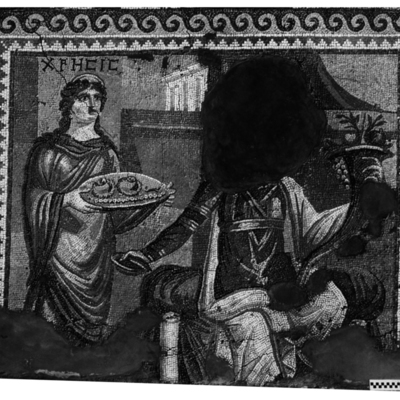 Mosaic panel A from Room 1 two standing figures with their names Parthenope and Metiochos. 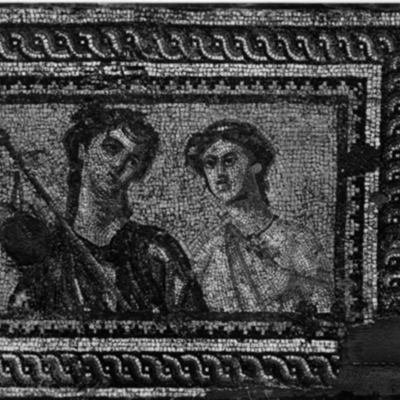 Mosaic panel A from Room 1 Metiochos and Parthenope. 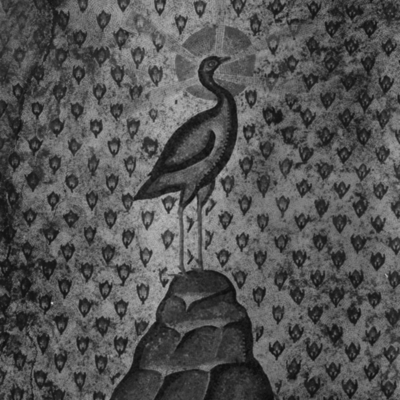 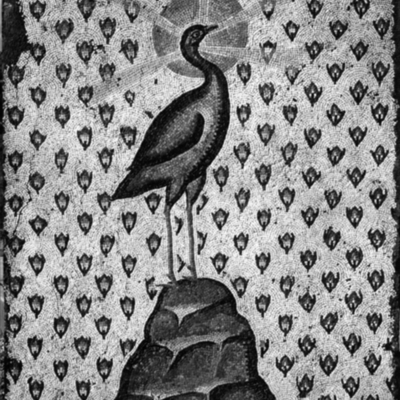 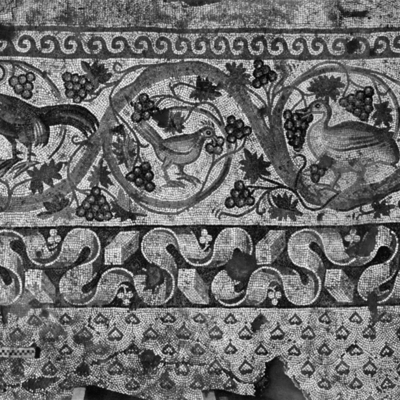 Panel A of mosaic pavement showing birds wreaths and a peacock. 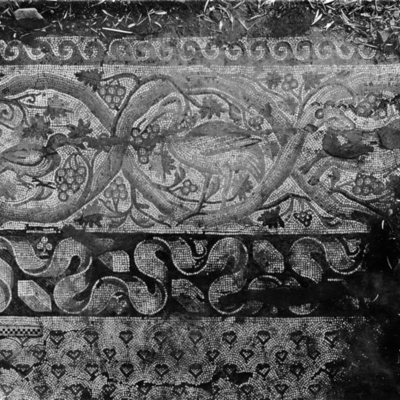 Detail of the floral carpet around the Phoenix in Room 1. 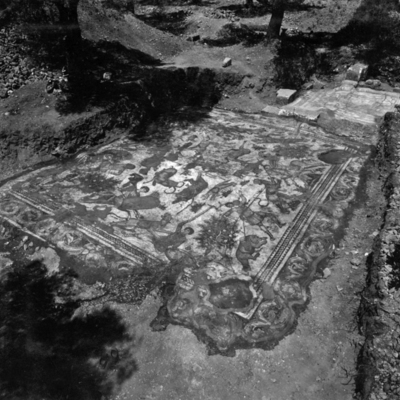 View of the floral carpet in Room 1 with a geometric mosaic uncovered in background. 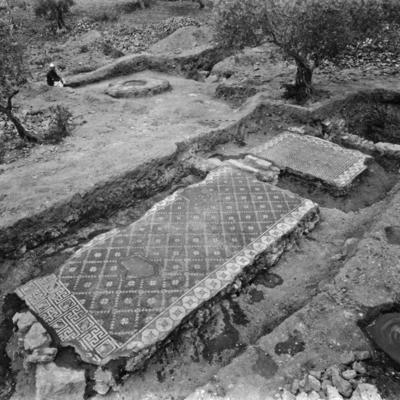 Exacavtion view of mosaic floors in Rooms 1 (near) and 3 (background). 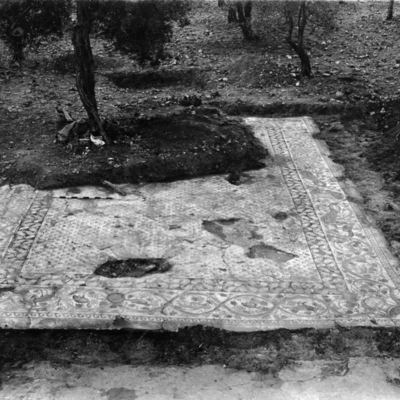 Excavation view of mosaic floors in Room 1 found under the Green Carpet mosaic. 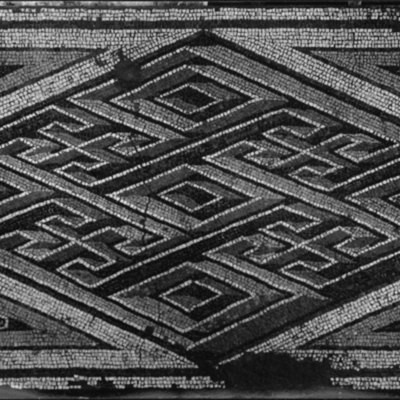 Detail of geometric mosaic found under the Green Carpet mosaic. 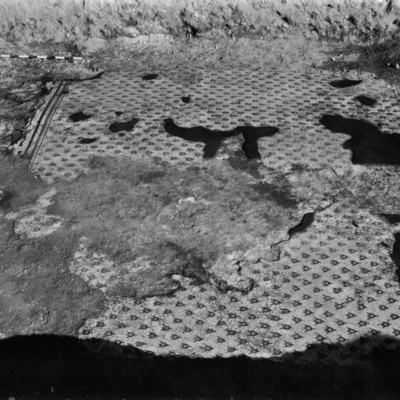 Excavation view of mosaic floor in Room 1.